Louisiana was claimed for the French crown by explorer Robert Cavalier, Sieur de La Salle in 1682. Louisiana volleyed between the French and the Spanish rule during the 17 Th century. In 1697, the French crown sent the explorers Jean-Baptiste Le Moyne de Bienville and his brother Pierre Le Moyne d’Iberville to explore the region of the lower Mississippi River to encourage trade and to plant a French colony. The city La Nouvelle-Orleans was founded in 1718 by Jean Baptiste Le Moyne de Bienville. Roving tribes of Native Americans, (Appalousa, Attakapas, and Chitimacha) had hunting camps and/or small villages on the many streams and lakes in the Atchafalaya Basin area. The natural alluvial ridges along the bayous would sustain the small settlements from annual spring flooding. As early as 1680’s, French trappers from Canada, (Courier du Bois) had come down the Mississippi River to Louisiana. It was not long before the trappers/woodsman crossed the vast swamp between the Mississippi River and the Bayou Teche, from east to west to trade with the Indians of the vast prairie area west of the Bayou Teche. According to legend, the first white settler to the Opelousas, LA. 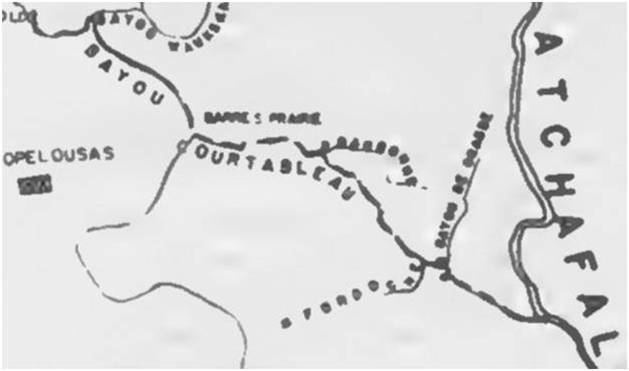 the area was Michel de Birotte, Courier du Bois who came around 1690. The Courier du Bois established a Trading Post at the headwaters of the Bayou Teche and at the time an unnamed stream that flowed into the Atchafalaya River (Bayou Courtableau). The Courier Du Bois exchanged European merchandise for pelts, bear oil, and even horses. Opelousas takes its name from the Native American tribe Appalousa, who had occupied the area before European contact. In 1719, the French sent the first military to the Territory, when Ensign Nicolas Chauvin de la Frénière and two others were sent to patrol the area. In 1720 the French colonial government established the Poste des Opelousas near the headwaters of Teche as a major trading organization for the developing area. The French encouraged immigration to Opelousas Post. 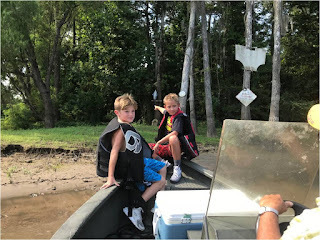 as they were interested in the vast prairie region west of the Atchafalaya Basin. By the early 1730s, French Courier du Bois were exploring the prairie region west of the Atchafalaya Basin to study the possibility of establishing a strategic trading point in the area to counter the Spanish presence to the west. By 1738 French traders were dealing regularly" with Indians of the region. In December 1738, two French entrepreneurs, Jean-Joseph Le Kintrek dit Dupont, a former jailer at New Orleans, and Joseph Blanpain, established a partnership that created an Indian trading venture in the area, which lasted until 1744. Le Kintrek is "the first European settler in the Opelousas post." The Indian trade proved to be profitable, and other traders followed, including André Massé and Jacques-Guillaume Courtableau, Le Kintrek's son-in-law. Both of which established cattle ranches along the Bayou Teche, where an off chute of the Bayou Teche flowed to the Atchafalaya River. The stream between became known as Bayou Courtableau, after Jacques-Guillaume Courtableau. The Opelousas post was so successful that the French officially established the Attakapas District (St Martinville) to control trade in the lower Teche area and to expand the trade with the Indians of the open prairies area. The official “Poste des Attakapas (St. Martinville), located thirty miles below Opelousas, was established in 1763, though like the Opelousas settlement, the Attakapas had resident settlers that dated from an earlier time. From the French word, Vache for Cow, a Vacherie is a Cajun French term for cattle fields. Cattle were brought to the New World by the Spanish soon after 1492. The term black cattle appears several times in descriptions of the cattle on the Teche, it is an archaic term of that time, and it refers to range cattle, i.e. free roaming, not to beasts of a certain color. The cattle of the Teche Vacherie’s were longhorns which were about half-wild, easily adaptable to almost any climate and native grasses. These cattle differed from those in the old world, their long horns which are generally about two and a half feet long, with their long shanks and feet, when seen from a distance, they look more like deer than like cows and oxen their usual red-brown color add to the illusion. The high alluvial ridges of the Bayou Teche, seasonal flooded meadows between the ridges and bluffs on the west side of the Teche provided a natural range for raising livestock. By early 1760’s most of the vast country of Opelousas - Attakapas region was taken up by only four or five Vacherie’s, very spread out and quite large, with absentee landowners and some were very poorly cared for. The prairie grasses were tall, and the cattle could roam au large, no fences confining them. Branding took the place of fences. It is known that Andre Masse', Antoine Bernard Dauterive, Jacques Roman, Jacques Joseph Sorrel de Contamine, were all from the Grenoble area in France and all three came to French Louisiana and established Vacherie’s on the lower Bayou Teche. It is believed that the three had some sort of connection. By 1723 the French had divided Louisiana into seven districts, with the Attakapas area within the Orleans District. Each district was served by a commandant and a judge for its military and civil need. One of the first to settle in the Attakapas area was a man named Andre Masse, a native of France, he was known as an audacious Frenchmen who rejected civilization. He may have come to New Orleans or Mobile originally in 1722 as a lieutenant in the military but by 1731 had acquired land along the Mississippi just upstream from New Orleans. In the 1740’s he moved to the Bayou Teche, near present-day Baldwin, La. / Charenton, LA. and established cattle Vacherie. At that time Both French and Spanish the claimed ownership of Louisiana. Spain claimed ownership of all land west of the Mississippi River. They considered Masse a trespasser. He is believed to the first settler in the lower Bayou Teche. The Masse’ Vacherie appears to have been maintained almost exclusively by about 20 slaves (half from the Senegambia region of Africa, and half Louisiana Creoles, the children of those Senegambians). In 1765 his name appears in a court case giving testimony that Edward Masse and Jean Antoine Bernard Dauterive, in partnership, operated a Vacherie (cattle range) on the Bayou Teche in what is now Iberia Parish on land that Andre Masse occupied. In 1806 Writer C.C. Robin in his book Voyage dans l'interieur de la Louisiane, wrote of the then decease Masse, “his dwelling was simple one open to the air, he slept on a bear skin stretched on boards. He was dressed head to foot in buckskin. He is eating utensils were a knife and a horn spoon hung at his belt”. 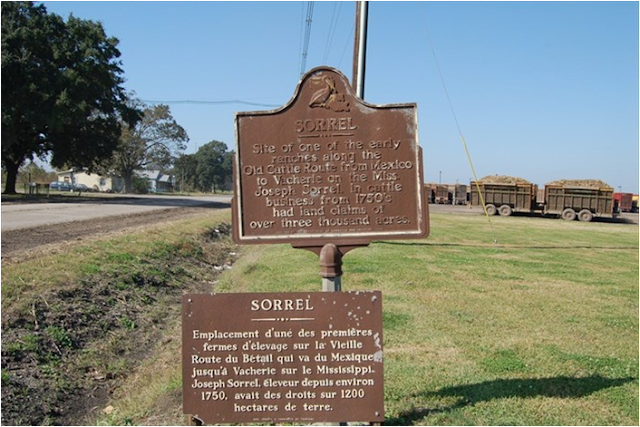 Jacques Joseph Sorrel, another officer of the French army came to Louisiana sometime in the 1750’s. He was discharged in 1762 and settled in the Attakapas district a year later. After living with Masse´ for several years, in 1768 he received a land grant about twenty-five kilometers downstream of Fausse Pointe, at what became the village of Sorrel, but for only six arpents of frontage and thirty of depth. He was a protégé´ of Masse´. Sorrel married Mademoiselles Grevemberg, a family of some wealth and involved in the cattle business at the time. However, she soon left him soon and returned to France away from the hard life in Louisiana. Sorrel built land claims of over 3000 acres. He helped to open the trade route through the lakes and bayous from Bayou Teche to the Mississippi River. It is believed by many historians Bayou Sorrel between Lower Grand River and Grand Lake was named after him. Historic marker near New Iberia, La. Jean Antoine Bernard Dauterive was born in Belley, about halfway between Lyon and Grenoble, the son of a military officer named Bernard Dauterive and Marie Jeanne St. Laurent. The family moved to New Orleans in 1719 for the father to assume the post of royal treasurer and by 1731 had acquired land just upstream from the city. In the 1760’s Antoine Bernard Dauterive, retired as a Captain in the French Infantry, he then acquired land south of New Orleans, at Barataria. 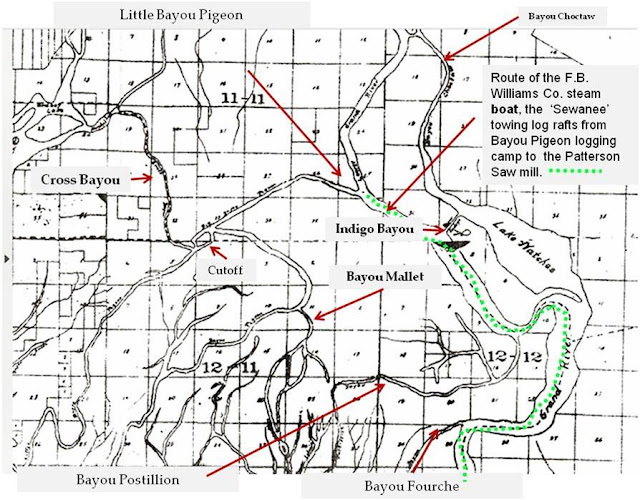 Prior to 1765 Dauterive also acquired some land from Andre Masse four leagues (a land measurement of eighty-four arpents, or three miles of land) on the Bayou Teche for raising cattle. He and Masse formed a partnership to manage and operate a Vacherie (cattle fields/range). In 1765, He acquired even larger land holdings at Bayou Goula between Bayou Plaquemine and Bayou Lafourche for the same purpose. Grevemberg arrived in Louisiana in the early 1720s to work as a laborer on a concession along the Ouachita River, changed his name to Jean Baptiste, and acquired the nickname Flamand, meaning Flemish. 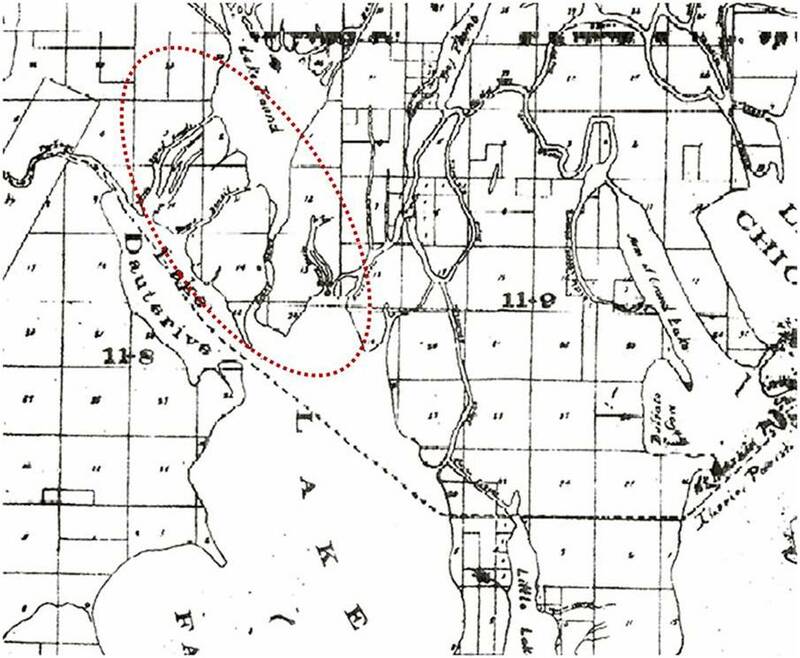 He began purchasing land around 1750, including the Fausse Pointe tract shown below. Grevemberg is known to have become involved in a feud with the Acadian immigrants over land ownership around Fausse Point. Census records clearly show considerable land and cattle ownership in this area of Louisiana before the arrival of the Acadians. For the most part, early habitation in the district was inhabited only by cattle drovers. There were very few permanent settlers, the few small landowners in the area got their Attakapas lands through purchase or occupancy and use; they did not have royal concessions at that time. Pre-Acadian Ranches of the Middle Teche Valley. The Attakapas Post had the best habitat for cattle. Bayou Teche created both the bluff and the Teche Ridge between thirty-five hundred and twenty-five hundred years ago when carrying the combined flows of the Mississippi and Atchafalaya rivers. The annual high-water flow cut the bluff that marks the western edge of the Atchafalaya Basin and created broad levees, forming the Teche Ridge as a cordon of high land within the basin. To the west, Bayou Tortue and the Vermillion River drained the back swamps during low water periods. The bluffs provided better pasture and grazing land than the swamps between the Mississippi River and eastern Atchafalaya basin. The Attakapas & Opelousas Post quickly became the primary suppliers for beef by the colonist in New Orleans. Getting cattle to the New Orleans markets around the massive Atchafalaya Basin swamp was a major problem. With its ever-fluctuating water levels moving cattle across streams and bayous west to east was fraught with danger and risk. Ferry crossings over streams were few and far between. Shipping processed meat was out of the question, no ice. The first cattle drives were down the Colette trail, named after Prevost dit Colette, one of the prominent families on the Bayou Teche. 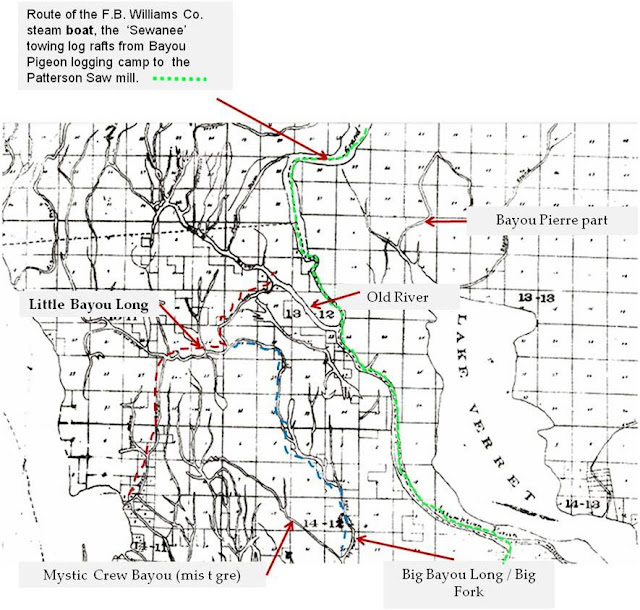 The route followed primitive trails down the Bayou Teche Alluvial Ridge to the Lower end Atchafalaya Basin, then following the Bayou Black natural ridges, crossing Bayou Lafourche and Bayou des Allemands to Mississippi River natural ridge to Algiers area of New Orleans. 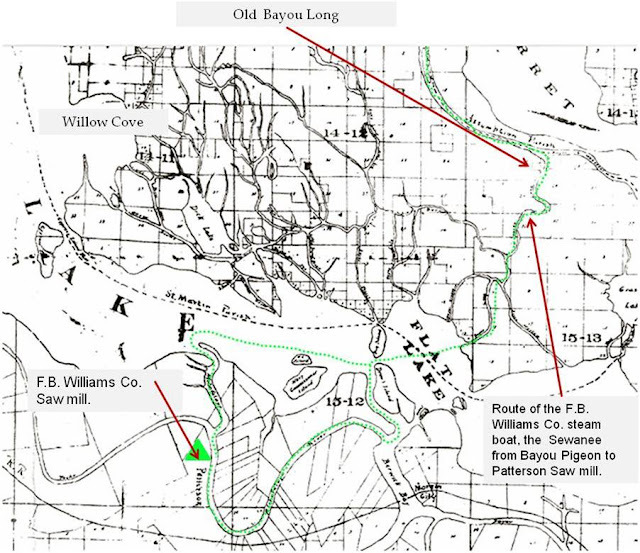 Start: Anywhere from Postes Des Opelousas going south, follow the Bayou Teche alluvial ridge, to present day Lake Palourde and then following the alluvial ridge of Bayou Black crossing the Bayou Lafourche around current day Raceland, LA. which may have had a ferry. 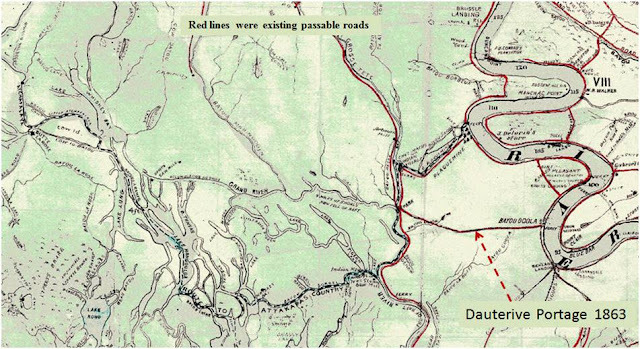 After leaving the Bayou Lafourche alluvial ridge came the most difficult part of the route, crossing the Des Allemand swamp and Bayou Des Allemands and on to the Mississippi River alluvial ridge around present-day Luling, LA. Following the Mississippi River ridge with the trail drive ending at Algiers area of New Orleans on the west side of the river. This route later became part of what was known as the Old Spanish Trail. It was a difficult and arduous journey. The First groups of Acadian exiles to America (1764) were settled on the Mississippi River at Bayou Lafourche. An area known as the Acadian Coast. Those Acadians who remained along the Mississippi and Bayou Lafourche adapted to the task of adapting their agricultural practices to Louisiana's long growing season and high annual precipitation levels. They placed ever-increasing emphasis on agricultural production. The second group of Acadian exiles to America were sent to the Attakapas region. Some historians believe this was part of a grand plan by the new Spanish government. Two hundred Acadian immigrants arrived in Louisiana in 1765, led by Joseph Broussard dit Beausoleil and his older brother Alexandre. Spanish Governor Aubry received those Acadians; he believed they would die in misery if he did not do something to help them. It happened that they were former residents of the Chignecto Isthmus area of Novia Scotia, which was a sparsely wooded region and was known as the heart of the Acadian cattle industry in Novia Scotia. Governor Aubrey wanted to buttress the emerging cattle industry along the Teche to provide meat for New Orleans. Here was his chance. Historians say Aubrey induced Juan Antonio Dauterive, who wanted to be a major cattle producer and already owned concessions on the Teche and at Bayou Goula on the Mississippi to make a pact with new Acadians. A win/win situation for the Governor, his interest was to expand and sustain the colony. Help the new Acadian colonist immigrants survive, and help Juan Antonio Dauterive, become a major cattle producer in the colony like he wanted to be. Other historians think it was just ‘fait compli’ that the Acadians ended up in the Attakapas. In April of 1765 Antoine Bernard Dauterive, Aubry, the Governor of Louisiana, the new Acadians settlers, and Andre Masse´ entered into an agreement to raise cattle on what until then had been the Masse´ Vacherie. Dauterive made the compact with eight Acadian “chiefs” including Joseph dit Beausoleil Broussard, Alexandre Broussard, Joseph Guilbeau, Jean Dugas, Olivier Thibodeau, Jean-Baptiste Broussard, Pierre Arseneau, and Victor Broussard. These eight leaders are thought to have been acting for their comrades that were not present at the formal meeting attended by the governor. Dauterive agreed to furnish five cows and one bull to each willing Acadian, once the newcomers were on the western frontier. After six years, Dauterive would get half their herds’ increases. From their shares, the Acadians would also return to Dauterive his initial investments. With the agreement signed the second major group of Acadians to reach Louisiana made their way to the Attkapas, via boat trip up the Mississippi, to Bayou Plaquemine across the Atchafalaya Swamp to the Bayou Teche. In May of 1765, the Acadians, led by Joseph Broussard dit Beausoleil and the Acadians, arrived on the Bayou Teche. There was one problem, the new colonists did not settle on the ceded land of Dauterive and Masse along Bayou Teche as they had apparently agreed to do back in New Orleans. The Acadians instead decided to settle farther down Bayou Teche along the Fausse Pointe, an odd-shaped peninsula formed by an extreme oxbow of the Teche. 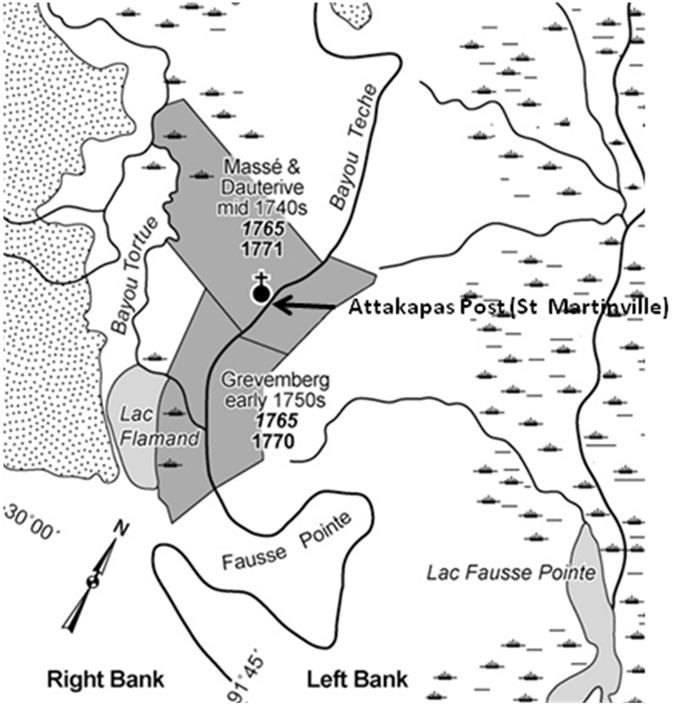 The Acadian Attakapas settlements lay on both banks of the lower Teche at what came to be called Fausse Pointe, le premier camp d'en bas, or the first place lower down; le dernier camp d'en bas, or the last place lower down. The authors found conflicting information as to whether the five cows and one bull were ever delivered to the Acadians as promised by the compact. It is obvious from the maps that all the Acadians did not settle on the land of Masse and Dauterive. It is possible that around mid-May, several Acadian families did briefly inhabit some of Dauterive and Masse’s ceded land in accord with the land exchange deal made back in New Orleans. Once on the frontier, these families may have also received cattle from Dauterive in agreement with the cattle compact made in the City. However, the author could find is no data that suggests the agreement was ever carried out in full. It is known that some of the Acadians bought some cattle from Jean-Baptiste Grevemberg. Shortly after settling at Fausse point the Acadians and Grevemberg developed a feud, the Acadians complained of crop damages and from the large Vacherie’s wild cattle, with the Vacherie’s claiming squatting and cattle rustling by the Acadians. Grevemberg complained to French officials that the newcomers were settling on his cattle-grazing Fausse Pointe peninsula land. As it turned out Grevemberg did not have a clear title either. The officials granted the Fausse Pointe to Grevemberg in July 1765. However, the Acadians did not / would not vacate all the west-bank land on the Fausse Pointe peninsula. The first years were very hard on the Acadians, a deadly epidemic took the lives of no less than 39 Acadians, they persevered through and eventually, the governor granted them land ownership. After Spain officially took control of the colony from the French, the Spanish governor granted the Acadian Exiles over two dozen land grants. These land grants totaled over 10,000 acres. By 1783, more Acadians arrived, and a new Spanish governor issued more land grants, raising total acreage to over 18,000 acres. The Teche alluvial plain offered a different opportunity for Acadians of the Attakapas versus Acadians of Mississippi River / Bayou Lafourche. The Bayou Teche Acadians developed a slightly different model for ranching than the large Vacherie’s which grazed their large feral herds on open range with no interest in cropping. Still, this model was in contrast to the pure Petite Habitant, small farmer model on Mississippi / Lafourche side of the Basin, which demanded land clearing of back swamps and, maintaining levees, none of that was required to raise cattle. Capitalizing on the habitat/nutrition found in prairie and marsh grasses, facilitated cattle raising. supplemental feed was unnecessary local laws allowed the cattle to roam at large, no fences confining them. Fences were only used to keep cattle out of gardens. Branding took the place of fences, separating one person’s cattle from another. At first, this model resulted in conflicts, such as additional Acadian claims for crop damages from the free-roaming cattle and the large Vacherie’s claiming cattle rustling. 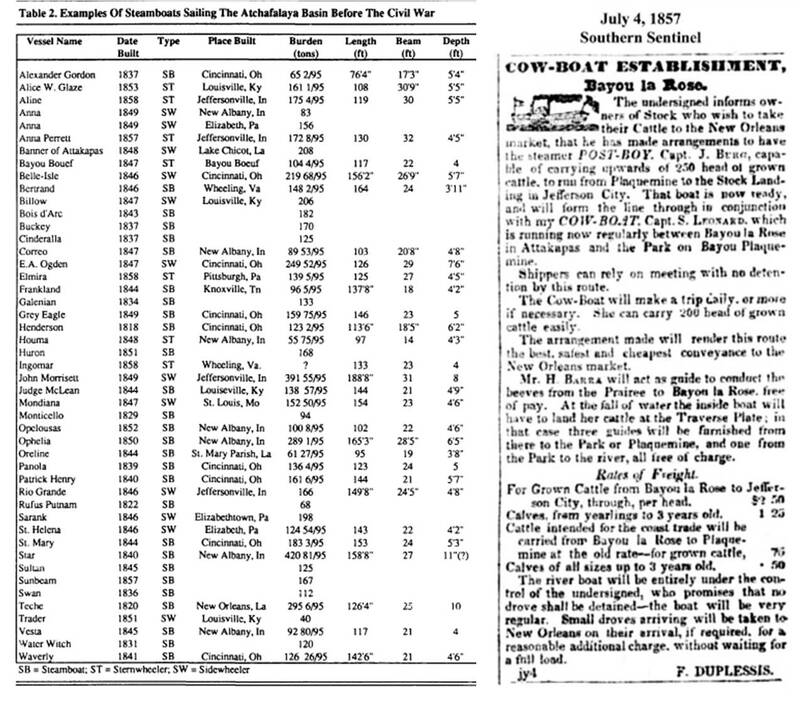 By 1771, the average Acadian household in the area had 22 cattle. He also had 6 horses, a luxury they hadn’t known in Acadia. By the end of the century, most Acadian ranches had increased their holdings of livestock to over 100 head. The Acadian settlers west of the Atchafalaya Basin placed ever decreasing emphasis on agricultural production and focused on livestock raising. Cattle raising became the cash crop on the Teche. By the end of the 1770s, the districts of Opelousas and Attakapas had an estimated 10,000 cattle and 2,000 horses. Cattle drives from the Attakapas and Opelousas prairies remained the main source of beef in New Orleans throughout the eighteenth century, but the percentage of Acadian-owned cattle shipped to the colonial capital rose sharply as the prairie herds proliferated at an amazing rate in the 1780s and 1790s. Spain became an ally of the American Colonies during the American Revolution. The Acadians didn't mind being on the side of the enemies of England and a number of them joined the Spanish militia. Bernardo de Galvez, the Spanish governor needed beef to feed Spanish troops in New Orleans. Beef from Texas and the Attakapas was driven down the Colette trail New Orleans by Acadian drovers. Over nine thousand head of longhorn cattle were delivered to New Orleans. This is why many of Louisiana's old families can join Daughters of the American Revolution and Sons of the American Revolution because they are considered part of the effort for the revolutionary war. Faced with the difficulty of managing large herds with only the family labor pool, versus the large Vacherie’s like Masse, Sorrel, and Dauterive, with black slaves, and free people of color. The Acadians drove their surplus beef to markets whenever they were fit for sale, making for smaller cattle drives. The Colette Trail was a long push from the Opelousas Post. Crossing the Bayou Des Allemande swamp was very difficult. 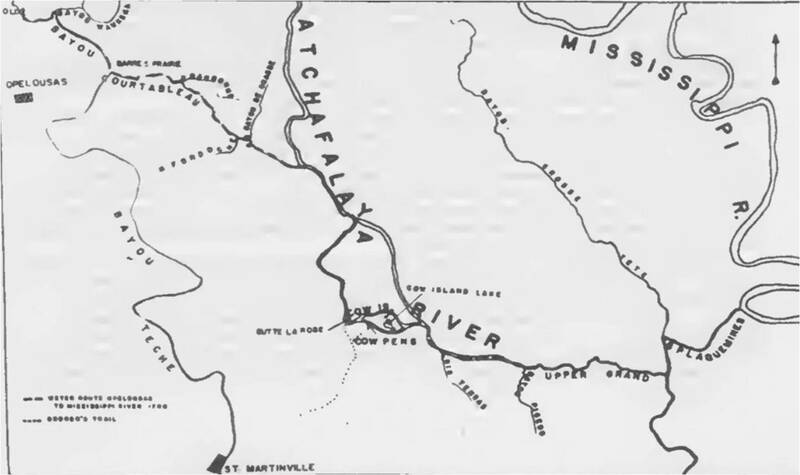 If going to the Natchez area, the herds were driven up the Atchafalaya River. If destined for the Mississippi River settlements then to New Orleans, the cattle were driven across the Atchafalaya Basin. 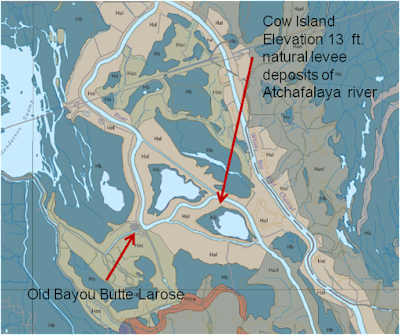 Following Bayou Courtableau, to The Atchafalaya River, pass Cow Island, on to Grand River to the intersection of Grand River /Bayou Plaquemines. This route was used from the 1770’s to early 1800’s. 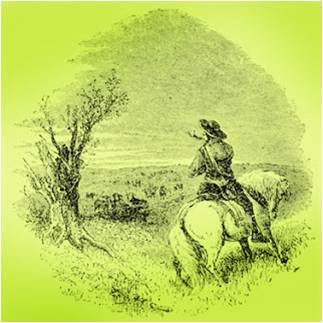 The drover’s descent through the Atchafalaya was on horseback and pirogues to drive the cattle across the Atchafalaya Basin to the east. Herds were usually small but could sometimes be 100 – 150 head. The animals swam or were ferried across the bayous. How could that be? Looking at the wild Atchafalaya River today it is hard to fathom that. The Atchafalaya River in the 1770’s, in low water, would have been a docile stream, easy to wade across. to confluence with Grand River. The Bayou Goula on the Mississippi river was first visited by French military L., Henri De Tonty, looking for the French explorer Robert De Lasalle. It was used as a stopping place on the Mississippi River to store supplies from the Illinois area bound for New Orleans. A dairy farm was established at the spot in 1751. It was further identified as cattle raising area by two different explorers in 1765, belonging to Pointe Coupee settlers. Dauterive, with his Attakapas Post concession, had a need shorter and easier route to move his cattle to the New Orleans Market. The route across the middle of Atchafalaya Basin was easier than the lower end of the Collette trail. He also had a need for cattle pens from where he could rest his beeves, before shipping / moving his cattle down the river to market. Claude Trenonau de Chamfret sold to Dauterive the Bayou Goula concession on Sept. 24, 1765, an obvious solution for Dauterive. Portage - the carrying of boats or goods overland from one body of water to another or around an obstacle or the route followed in making such a transfer. 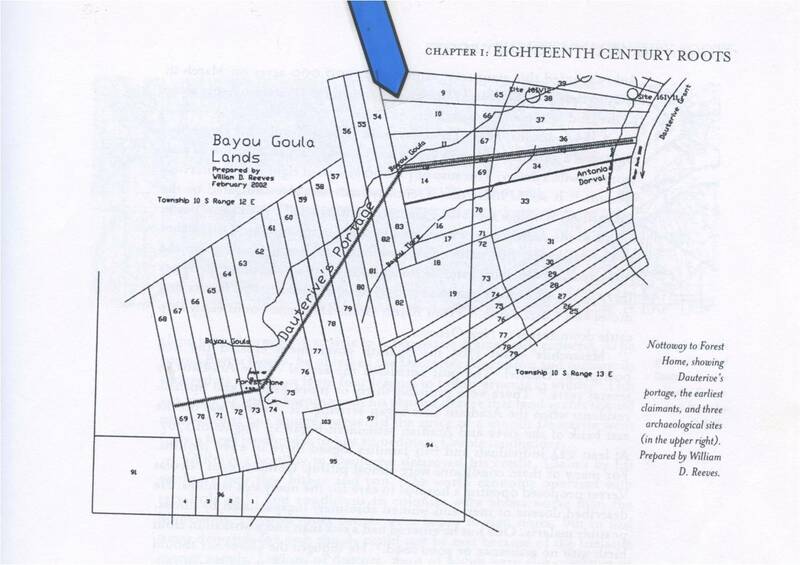 In 1765, with no road along Bayou Plaquemine, Dauterive had a primitive road built from the Bayou Goula cattle pens, to the confluence of Bayou Plaquemine with Grand River, a daunting task in 1765. It appears that most of the route would have followed the Bayou Goula ridge. Governor Charles Aubrey used the portage to send dispatches from New Orleans to the Attakapas Post. This would suggest that the road became well traveled. 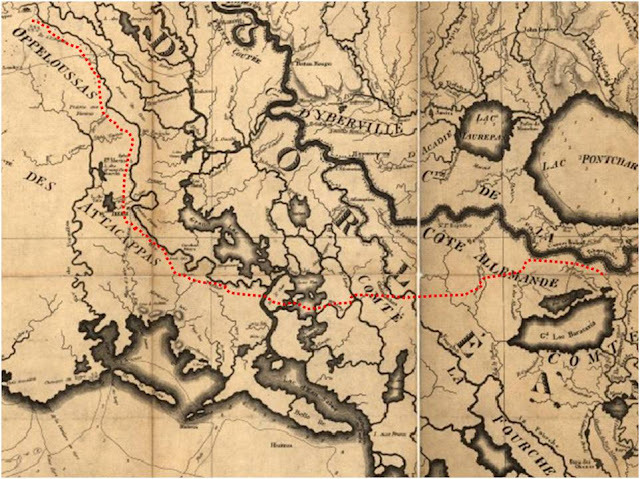 The era of the cattle drives across the Across the Atchafalaya basin lasted less than 70 years, 1770- 1840. The era of the steamboats in the basin replaced the drover’s road outlined on the Ludlow map of 1815. After the Civil War, the coming of the railroads replaced the Colette trail. Livestock arrived on the banks of Bayou Teche long before 1766. Feral horses and cattle derived from Spanish efforts to colonize Texas constituted part of the French Trade with Native Americans during the early eighteenth century. As the French and Spanish increasingly settled the Louisiana-Texas frontier, a contraband trade developed in which cattle made up part of the eastward flow. French-speaking pioneers arrived as early as 1745 and established cattle ranches on the Bayou Teche. Cattle became the first cash crop of the Opelousas / Attakapas region. 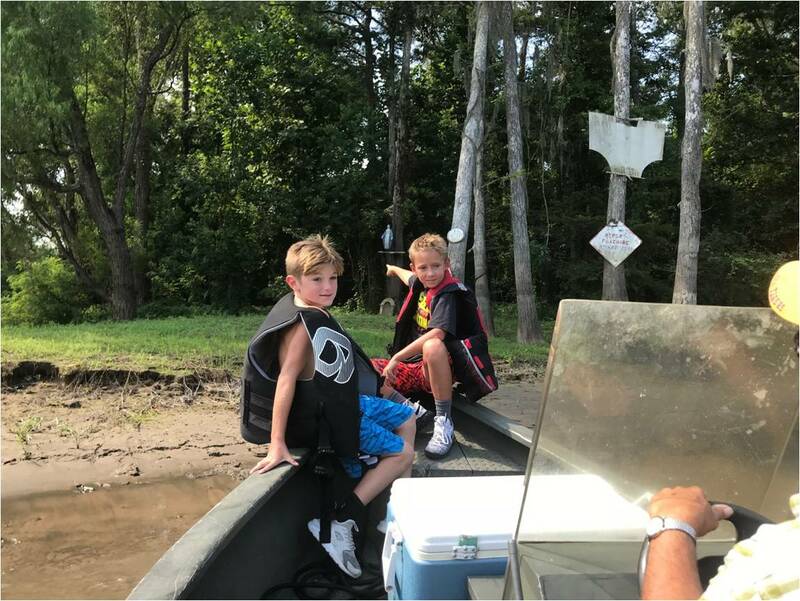 The challenges facing drovers as they moved cattle across the middle Atchafalaya Basin as only we Spillway Sportsman can understand were many. Small bayous that off chute the major stream, hundreds of sloughs, snakes and alligators, mosquitoes and thick humidity was daunting. Lost of cows by drowning and not to be overlooked, drowning of cowboys. 1. Cattle drives started in Louisiana before the famous Cattle drives in Texas and old west. 2. 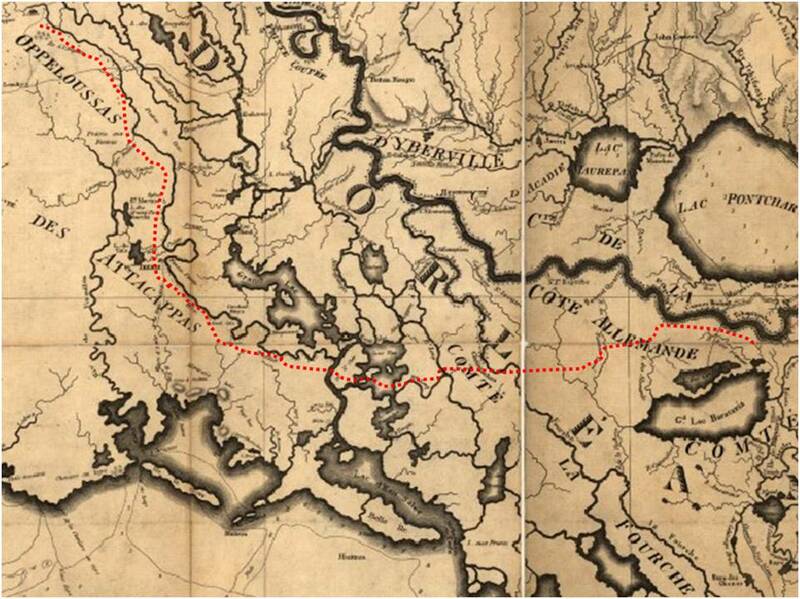 The Louisiana cattle drive era started in the Atchafalaya Heritage area, by French-speaking pioneers. 3. Cattle drives (Pousser Des Betes) across the basin are really almost Lost History. How many times have you read or heard of this history? Share & Preserve the Heritage. 4. 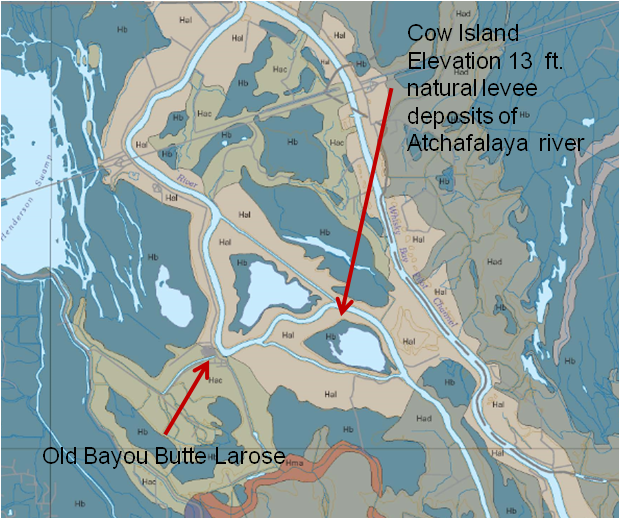 Cattle drives were able to cross the heart of the Atchafalaya Basin because the basin was a lot drier in the 18 th century and the first part of 19 century before the Europeans started modifying the hydrology of the Mississippi River. 5. 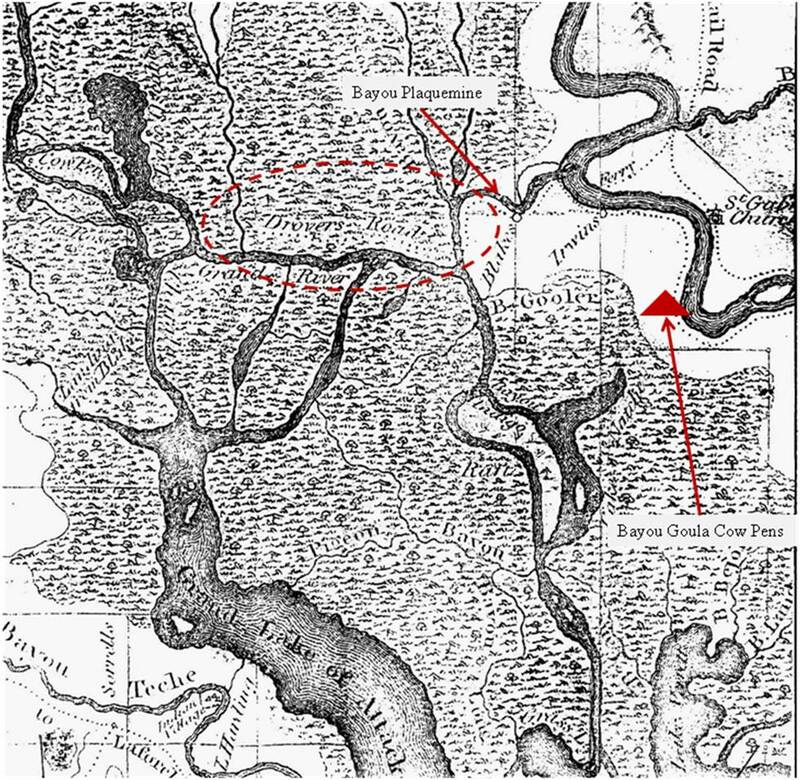 Acadians of the east and west Atchafalaya Basin (Lafourche and Teche) were thought to not have communicated very much because of the Atchafalaya Basin acting a physical barrier. But records prove, even though their folklife developed differently because of the environments they lived in, at least in the 18 and early 19 centuries they interacted frequently. 6. Bayou Names, like Bayou Courtableau, Bayou Sorrel, Lake Dauterive, and Bayou Grevemberg are named after the landowners of the Bayou Teche Vacherie’s. I want to express my appreciation & thanks to Stella Carline Tanoos for helping to gather documents and peer review for the supplement on Cattle Drives (Pousser Des bêtes, Lost History of the Atchafalaya). The information Stella provided was of great help in telling the story. 11. W. T. Block; Bellowing Cows Marked First Trail To New Orleans Reprinted from Beaumont Enterprise, about 1975, exact date unknown; also in Block, Frontier Tales of The Texas-Louisiana Borderlands, MSS, pp. 153-158, in Lamar and Tyrrell libraries. 20.Francis Duplessis, Plaquemine survey, Oct. 1794 Louisiana State Archives , Genealogical Society of Utah Microfilm: 1766-1929, Accession P1985-4, Reel 6. Mother Nature is the best teacher and getting kids outside to learn and play is good for their brains and their bodies. 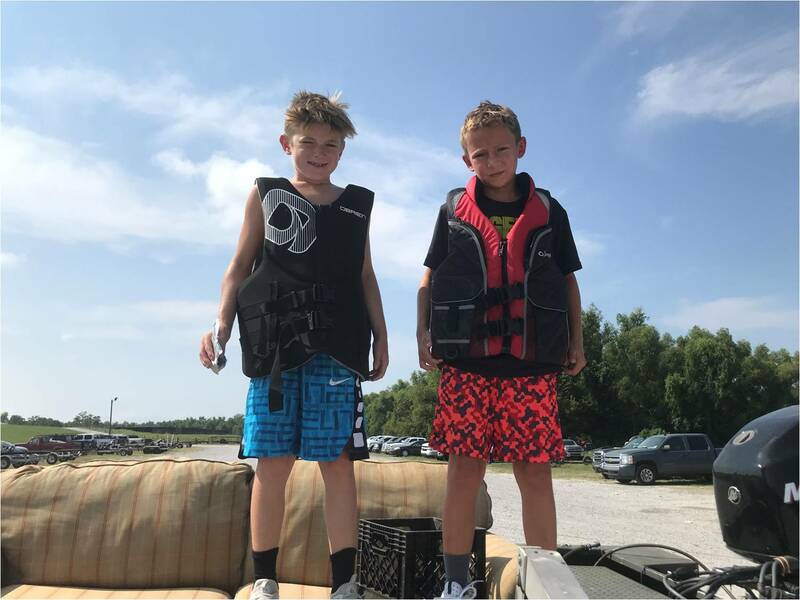 Survey data says that the impact of changing lifestyles, urbanization and the commercialization of children’s activities, that children today are spending nearly 8 hours a day using some form of electronic entertainment media. Only 6 percent of children ages 9-13 play outside on their own. We are at risk of losing an entire generation’s appreciation for how nature and the outdoors works. When I say outdoor skill I am talking hunting and fishing, and a variety of wildlife related activities. I believe being in the outdoors is critical to developing observation skills, building confidence and problem solving. Hunting and fishing are a part of the Atchafalaya and Bayou Pigeon heritage. Also , I am concerned that outdoor activities and natural heritage being taught in the school classroom, is biased against Hunting and focuses on environmental activism and political correctness. Ms. Patricia Settoon of Bayou Pigeon, certified teacher, copy editor of the Bayou Pigeon book is constantly reminding me... a good teacher challenges, inspires, encourages, is patient, avoids bad mannerisms, speaks clearly and distinctly, uses plain spoken language. Honor ... Our Lady Queen of Peace and Patron of Bayou Pigeon...Guide us from unseen underwater logs, stumps, and pilings. Keep the waters clean so Gods creatures can swim, fly and jump. Bless us all who view fish and hunt in these waters. full time commercial fisherman Mr. Stud Gros and his helper of Pierre Part, La. Lesson 6 ... At the houseboat...What's that ? Little Bayou Pigeon 1936 ...What have they done to our waterways ? The Atchafalaya River begins near Simmesport, LA. in an area known as the Three Rivers Area, i.e., this is where the Mississippi, Red, and Atchafalaya all come together, southward down to Morgan City and the Gulf of Mexico. The Atchafalaya River and its surrounding flood plain / basin are a unique combination of wetlands, bayous, marshes, estuaries, and river delta area. Best known for its iconic cypress-tupelo swamps, at 260,000 acres this block of forest represents the largest remaining contiguous tract of coastal cypress in the US. It is sometimes referred to as “America’s Foreign Country", as it covers an area 20 miles wide and 150 miles long. It is designated a National Heritage Area, and is viewed by many as a National Treasure. I've always been fascinated by knowing / understanding the paths / routes that waterways take in the Atchafalaya Basin. When I was growing up at Bayou Pigeon, LA., it was essential for the indigenous swamper / commercial fisherman to get around in the basin with speed and accuracy. 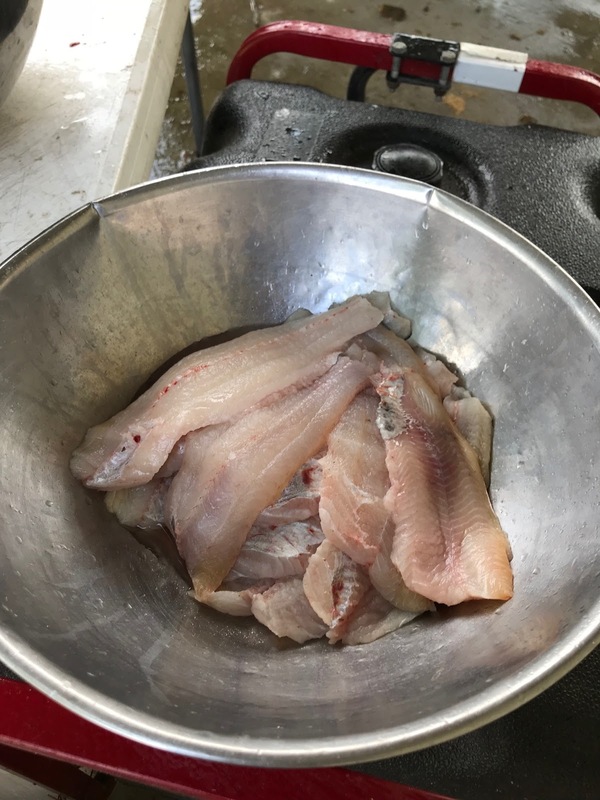 Every good Atchafalaya Basin commercial fisherman / hunter I have ever known knows the basin waterways like their own house. They understand that knowing current flow and water depth are critical to good catches. Waterways are/were the fisherman’s highways; they are the ways the commercial fishermen gets to his ‘work’ (his place of employment). 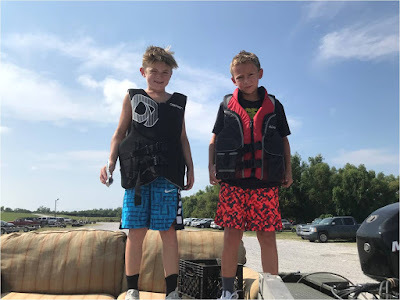 One of the first things the commercial fishermen teaches their sons is the back ways and shortcuts to the best fishing / hunting spots in day or night. Being in the basin at night is completely different than being there during daylight. I can recall in my younger years being so turned around on the waterways at night that I would have to throw my hat in the air to see which way was down. My latest book, ‘Heritage of the Atchafalaya, A Natural and Cultural History of the Atchafalaya Basin’, was already published when I realized there was an important chapter that I missed, i.e., the history of the waterways before the Atchafalaya Floodway levees, access canals, and pipeline canals were constructed, “When the Waterways Were Open’. I cannot believe I did not think to include that...especially since it is part of our Cajun heritage to be good, at direction in the woods! My objective is to document and preserve the heritage of the Atchafalaya Basin waterways. 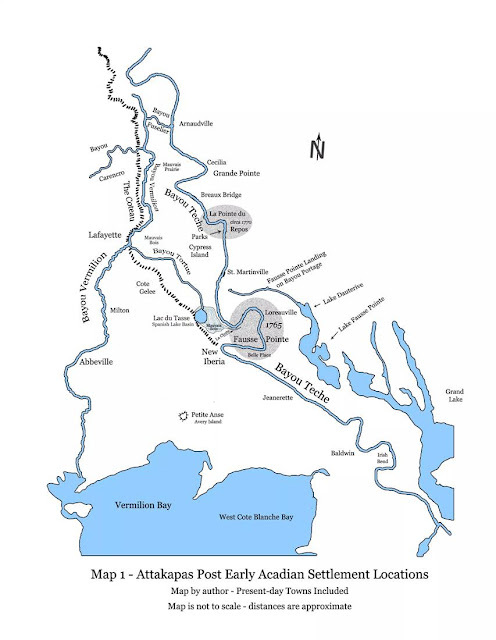 In my view, every waterway in the basin is worthy of knowing its history / heritage, some more than others, but still, all are worth understanding. 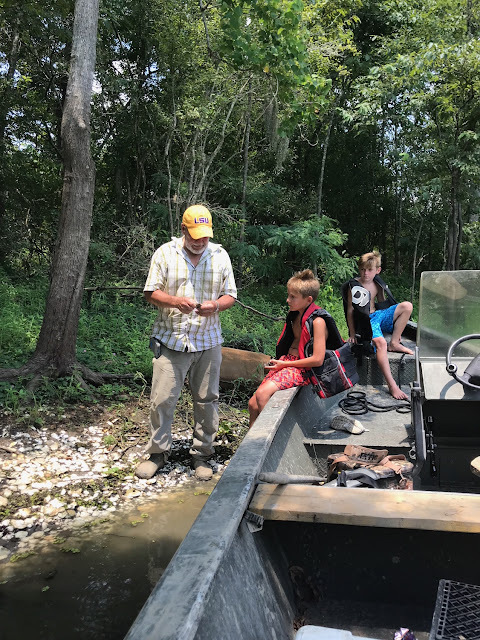 But, it’s more than that, I find myself wishing for a plain spoken explanation of how the Atchafalaya Basin waterways got to what they are today. 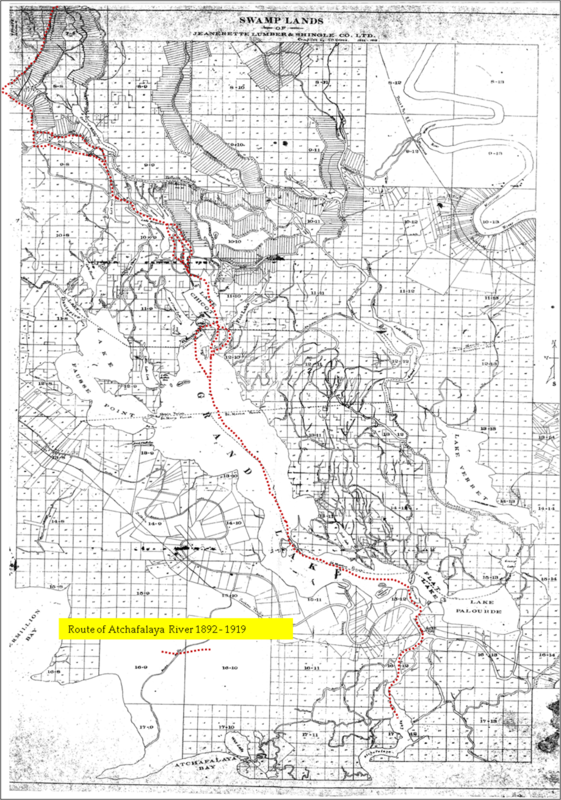 What did the basin waterways looked like before the Atchafalaya Floodway and industrialized man and concrete conquered and disrupted the basin hydrology and eco system? 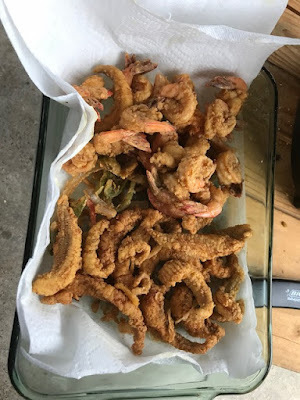 Why are the bayous like they are? Why / how did they change so much? Who decided where the Basin guide levees would be located? How were the guide levees dug? Why / how did sedimentation fill in Grand Lake? Why did scrub shrub take over the Long View? The interested reader , can read my book ‘Heritage of the Atchafalaya, A Cultural and Natural History of the Atchafalaya Basin’ and the National Geographic, vol. 156, no. 3 (September,1979) for an article on the Atchafalaya. 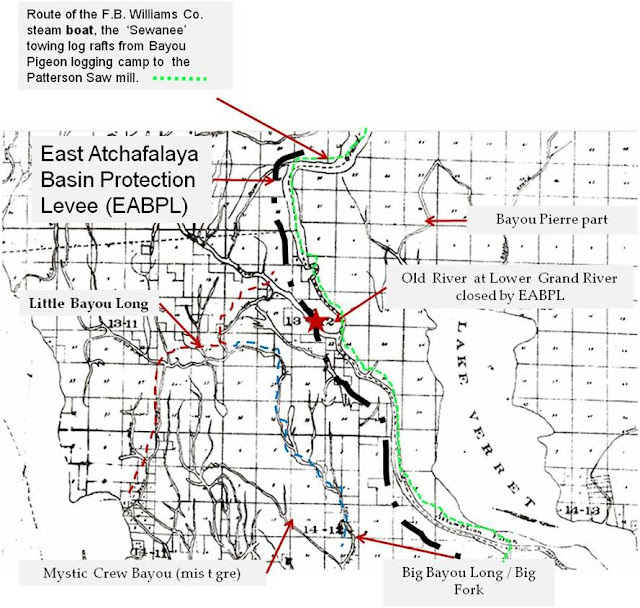 They provide additional information of how the Atchafalaya Basin evolved. Bittersweet, because, geomorphic wise, the time period from 1870 – 1932 was the last time that the Atchafalaya River basin was a free-flowing river system and also that’s when in earnest that the Cajuns established their roots and developed a unique new heritage, Bayou Cajuns. They became ‘Petite Habitant de Maracage, i.e., Farmers of the Swamp’. • Spring, High water, annual flood pulse. • Summer, - Middle, in between the high and low. • 3. Fall / Winter – Low Water, Fall and Winter. Bittersweet, because at the same time it was the beginning of the Industrial Cypress Logging in the Basin, which cut down, a thousand years of virgin cypress trees in less than a half century. There are very few if any, historical maps of the Atchafalaya Basin 'When It Was A Free Flowing River Basin System', that is with enough detail to use them. 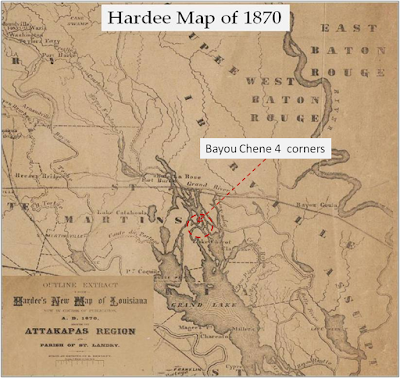 For example, there is Hardee Map of the Attakapas region in 1870; it giving an outline / and general idea of the Atchafalaya River Basin’s main bayous. The proportion looks ok, but detail is obviously lacking. This map clearly shows the distinct physical layout of Bayou Chene but does not call it by name. Whereas, Bayou Sorrel, Little Bayou Pigeon, Big Bayou Pigeon, and Belle River are identified, but not in any detail. Corroborating that they were recognized as streams of significance. For this story, I used a historical map, ‘Swamps Lands of Jeanerette Lumber and Shingle Company LTD. 1892 – 1915. Compiled by H.B. Hewes, Vice President, Treasurer, and General Manager of Jeanerette L&S Company. The map was never officially published but it did appear in the American Lumberman. "A Journey through the Vast Downman Cypress Interests with Camera and Pen", American Lumberman, Aug 5, 1905 pp.43-82. Chicago: American Lumberman, 1905, where it received much interest. 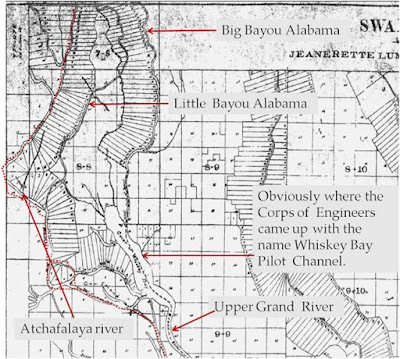 Hewes had Jeanerette engineers and timber cruisers map out the core of the Atchafalaya Basin red cypress area. In all my research it is the most detailed accurate map pre USGS topo maps. Hewes went so far as to overlay the Arpents survey plot’s and the Township / Ranges, Section plot numbers on his base map. 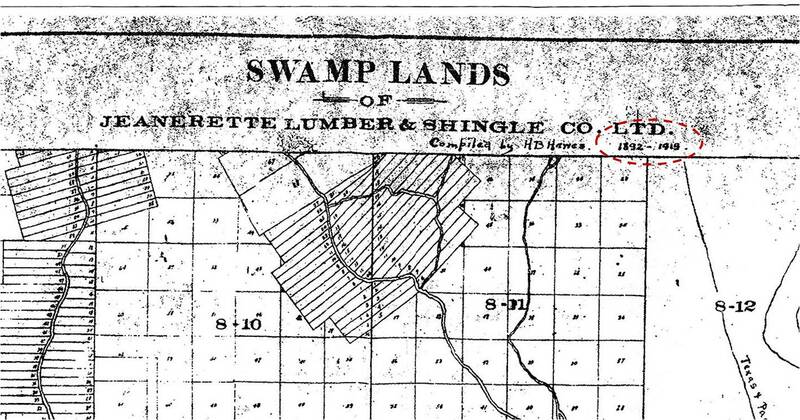 He included outlines of legal descriptions of acres / lots that were owned by Jeanerette L&S. Hewes and Jeanerette Lumber Shingle would have wanted an accurate map as they were embarking on some serious industrialized cypress logging that involved a lot of money and they had a reputation of integrity in the lumber business. Essentially, 1892 was the beginning of Industrial Cypress logging in the basin, i.e., the use of the Overhead skidder and pull boat skidder system. In my research, it is the most accurate map of the Atchafalaya Basin prior to USGS topographical maps, of which the earliest date I have seen is 1935. The date is critical because after 1932 the Atchafalaya River did not meet the criteria to be identified as free flowing water way. To fully comprehend and appreciate the heritage associated with the rivers and bayous of the Atchafalaya Basin today, you must journey back to when the Atchafalaya was a free flowing river basin system. A free-flowing river is one unaffected by human-made changes to its flow and connectivity. The Atchafalaya River Basin was formed as part of earlier delta formations of the Mississippi to its east and west, and by the flow of the Red River from Texas into central Louisiana. Around 1500 AD the Mississippi meandered into Red River, the lower part of the Red, below the meander became the Atchafalaya River. 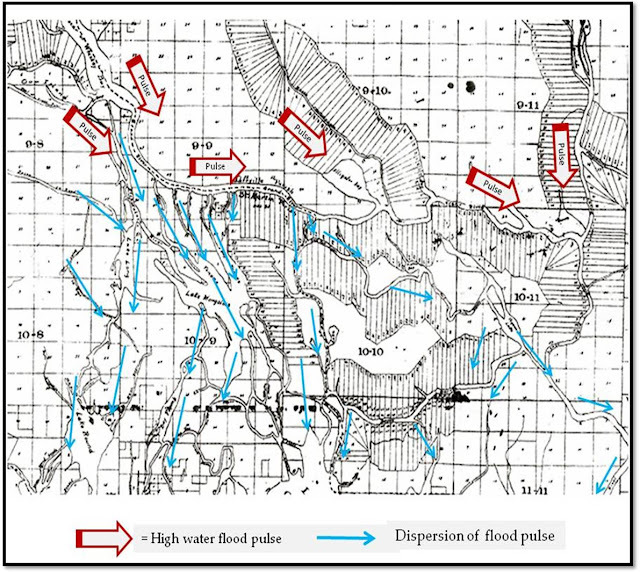 It was free-flowing river basin system unaffected by human-made changes to its flow and connectivity. Water, silt, and other natural materials moved along unobstructed. Animals and fish could swim up and down stream at will. The river itself swelled and shrank naturally, flowed at an organic volume and rate, and replenished groundwater sources. Prior to man's activity, the basin was characterized by sluggish streams, swamps, and extensive lakes. 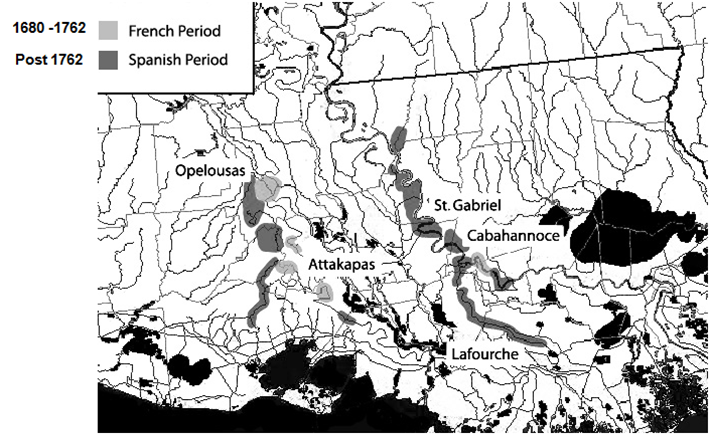 Little physiographic change appears to have occurred within the Atchafalaya Basin for the first 300 years of the modern Atchafalaya River. All that changed in 1831, at a spot below where the Mississippi had originally meandered into the Red River. 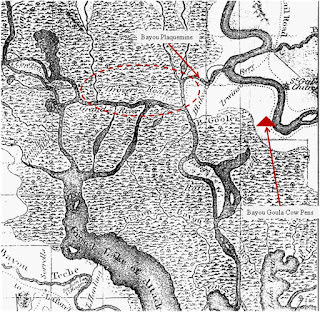 The mouth of the Atchafalaya River at the original Mississippi / Red meander became blocked by a log jam over 20 miles long, hindering navigation. Capt. Henry M. Shreve, founder of Shreveport and a well known river engineer, dug a canal (Shreves Cut) through the neck of Turnbull's Bend connecting the Mississippi to the Atchafalaya. Essentially this was just speeding up what would have eventually occur. Within days the cut was so large it became the Mississippi Rivers new route into the Atchafalaya River. The Atchafalaya would still carry water from the Red River but not direct from the Mississippi. With the removal of the Mississippi and Atchafalaya River rafts, log jams beginning in the 1840’s to 1870’s, the Atchafalaya River main channel scoured its way through the natural basin from the northwest to southeast corner. The Atchafalaya River progressively increased its diversion of waters from the Mississippi River and each year the Atchafalaya became a more aggressive, dangerous river in the spring flood pulse. For thousands of years the Atchafalaya Basin had soaked up the Mississippi River’s annual floodwater's and distributed them throughout its streams, bayous, lakes and fresh water marshlands. Water flowed in and spread all around. There was nothing to hold it back or hem it in. It was a balanced system. 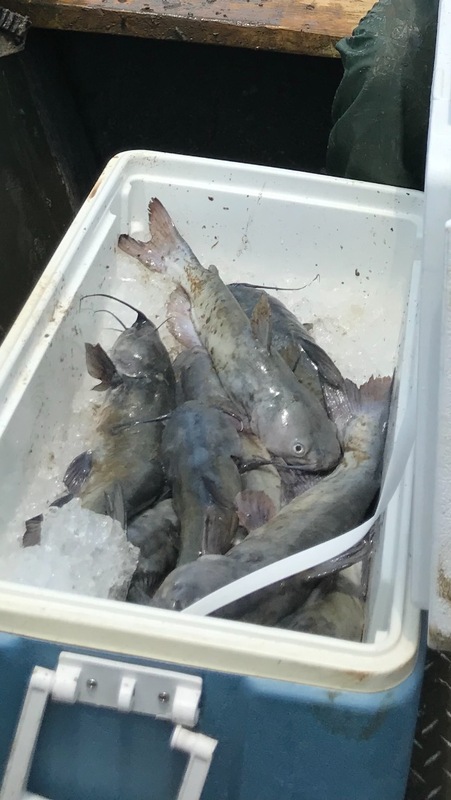 The annual flood pulse brought much-needed nutrients to the swamp and the fish and wildlife were abundant. 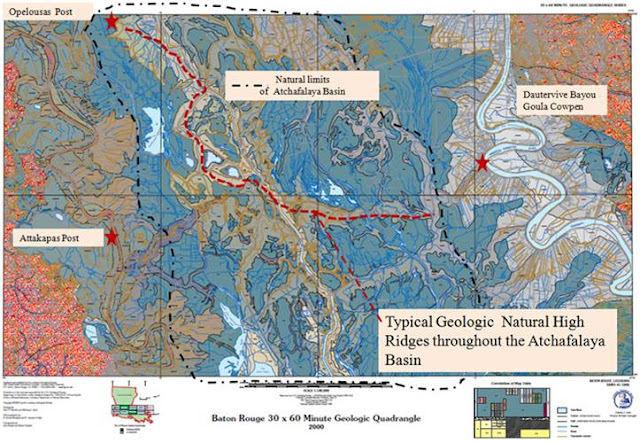 Note the East/West – North / South flow patterns and connections of the bayous / streams, and the arpent surveying (land division) method, long narrow strips of land, fronting the bayous / streams used in this area of the basin. The arpent system facilitated rapid settlement of the swamp, by providing as many settlers as possible with some bayou frontage for access. Which indirectly enticed settlers to the area and also allowing small farmers, who could not afford to buy large blocks or tracts to purchase smaller tracts. Private ownership of land in the basin, versus public ownership, can be traced back to the desire of the French, Spanish and the USA, to settle the area and convert what (at the time) they thought to useless swamp land to productive agriculture land. In English units, an arpent is 192 feet with the usual stream-front property measuring 8 arpents along the stream and 40 arpents to the rear of the property, with perpendicular lines extending from each end of the property to the rear of the property (giving the advantage to convex property owners, where the perpendicular lines would fan out as they proceeded towards the rear). Note the many streams of water flow straight south, downhill, into Old River. Facilitating fast flow, good current keeping Old River wide and deep… into Lower Grand River, Godell, and Belle River and on to the Grassy Lake, Lake Palourde. At the same time feeding south to old Bayou Long. The elevation of the swamp floor in the area below Old River, between Grand Lake and Lower Grand River is some of the lowest bed elevations in the entire Lower Atchafalaya Floodway. 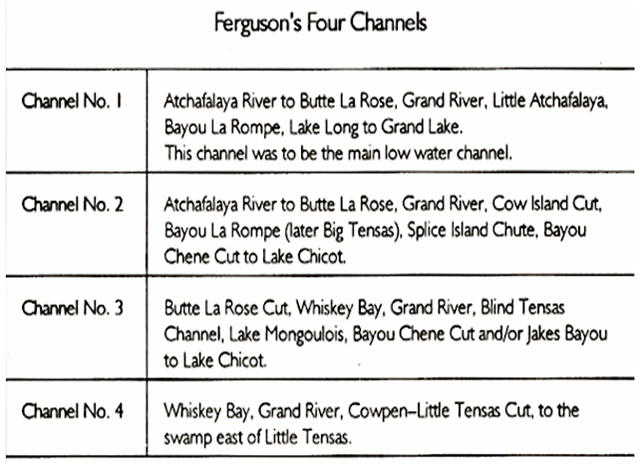 Note the number of streams available to distribute the flood pulse into lower Grand Lake and out the Atchafalaya River into Berwick Bay. Also, the map cartographer nomenclature for Atchafalaya River goes into what is considered Bayou Teche to Patterson, La. Wildcat Bayou / West Fork Bayou Long, and Mockingbird Bayou are well defined even in low water stages, meaning in annual flood pulse they would have been fast flowing open streams. Sediment transport along the bed of a river / stream naturally affects the health of streams. When flow slows down sedimentation falls out. This makes you wonder how much influence water hyacinths and invasive grass played a part in sedimentation when they slow the flow of these streams. Bayou Chene, translated to Oak Bayou a small unincorporated community in St. Martin Parish, Louisiana, United States. The community was located in the center of Atchafalaya Basin and was primarily of Anglo / Saxon, English speaking heritage in a predominant Bayou Cajun culture. It was the only and the last inhabited swamp community in the interior of the Atchafalaya Basin. It had a Post office, school and church. Established in the 1830’s, abandoned in the 1950’s due to extreme flooding. 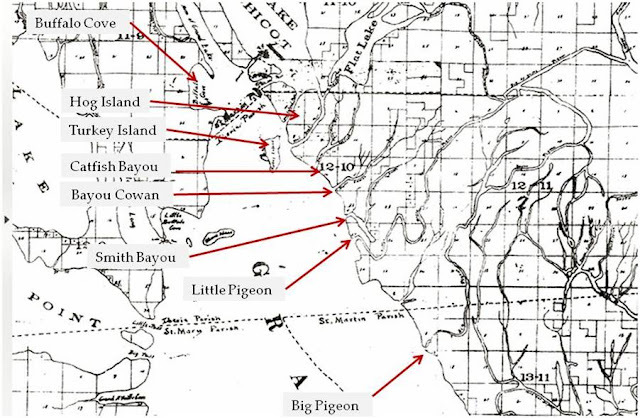 The physical landscape, the four corners made Bayou Chene a natural location for trapper rendezvous’ in the early exploration of the basin and as an inhabited place of settlers in antebellum era. Lake Fausse Point and Grand Lake still open to each other in this era. It appears where Lake Chicot emptied into Grand Lake, formed 4 sand bars. Two of which are Hog Island and Turkey Island and the other two unnamed. All surveyed, which means they were formed before 1836. This means there was sedimentation in this area from the early 1800’s. Catfish Bayou, Bayou Cowan, Smith Bayou, look to be braided streams formed from fast flowing waters as they start as sloughs and get bigger until they dump into Grand Lake. Most likely started in the early 1800’s and matured when the river rafts were removed from the head of the Atchafalaya. Whereas, Little Bayou Pigeon and Big Bayou Pigeon are much older, typical meandering type streams from lower Grand River until they dump into Grand Lake. With the exception of Shreve's 1831 cut, the Atchafalaya Basin, was still a free flowing river basin system until the 1930’s. Unless you live under a rock, most of the folks in Louisiana are aware of familiar with the existence of the Atchafalaya Floodway. As a result of the most extreme flood in North American recorded history, the Great Flood of 1927, the U.S. Congress passed the Flood Control Act of 1928, authorizing construction of levees, floodways, and other landscape /waterscape modifications to control the flow of the Mississippi River. The design of the most elaborate flood control system in United States history began immediately after the Flood Control Act of 1928. U.S. Army Corps of Engineers brainstormed several ways to control Old Man River. It included a massive system of levees on the Lower Mississippi. 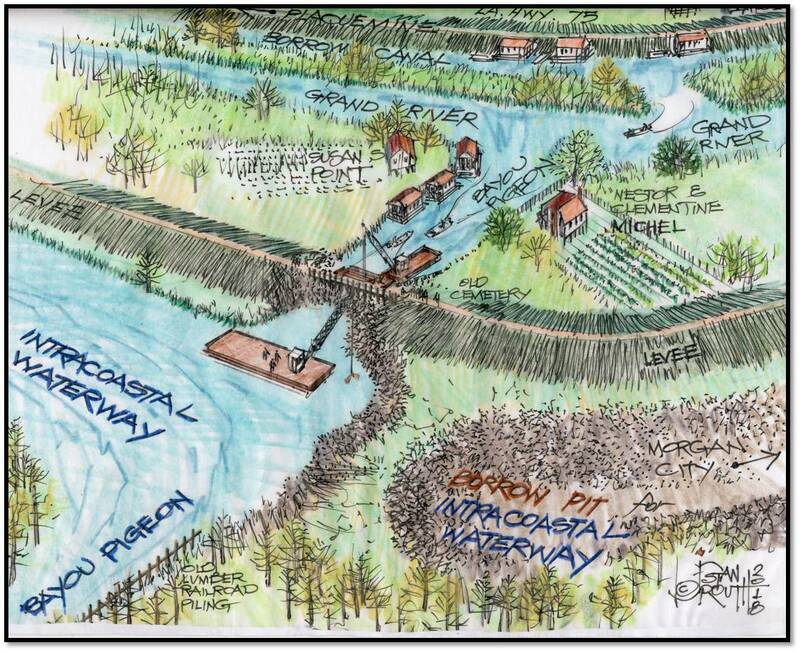 But, the Corps concluded levees alone would not be enough; the Corps of Engineers included in the plan the concept of floodway’s that could be opened up and speed the flood pulse to a receiving basin to relieve the pressure off the levees. 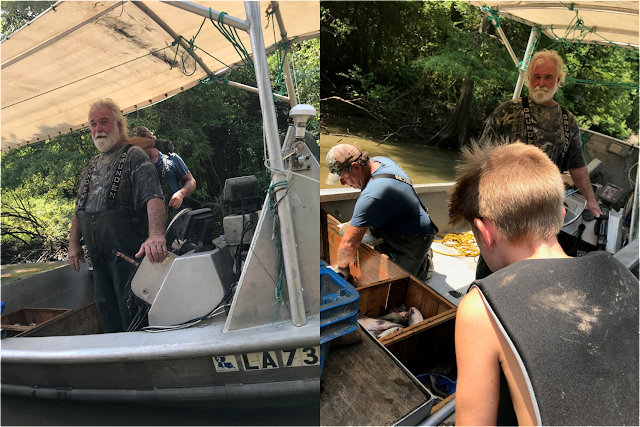 Later the plans included straightening, wider, deeper channels in the Atchafalaya River. In South Louisiana, the corps plan included a mind boggling idea, to leave the headwaters of the Atchafalaya River open, hem in the natural Atchafalaya River Basin between two levees, create a gigantic floodway, 1,400,000 acres of mostly bottomland hardwood and cypress / tupelo swamp between levees, set seventeen miles apart. The stated design of the Atchafalaya Basin Floodway would be to speed about one half of any 1000 year flood pulse of the Mississippi River / Red river to the Gulf of Mexico, essentially acting like a big ditch. This would take enough pressure off the lower Mississippi River levees and prevent the river from topping and / or crevassing the levees. Floodway guide levees! 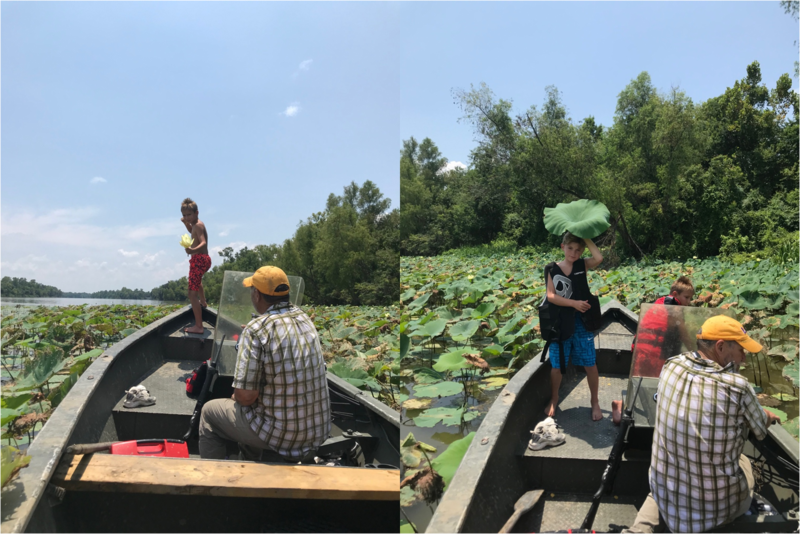 What Have We Done to the Atchafalaya Basin? An Explanation! Obviously, Floodways need guide levees! To minimize the flooding of private land, for the most part the route of the guide levees would be built on the rim of the lowest areas through the Atchafalaya Basin, roughly five to ten miles on either side of the Atchafalaya River, from Simmesport to Morgan City. The new guide levees would cut off more than 22 natural streams carrying nutrient rich flood waters to basin deltaic plain every spring. Not only disrupting the flow but cutting off all annual flood pulse water flow areas outside the levees, basically freezing those distributaries in time by reducing natural sedimentation process of the annual spring flood pulse. 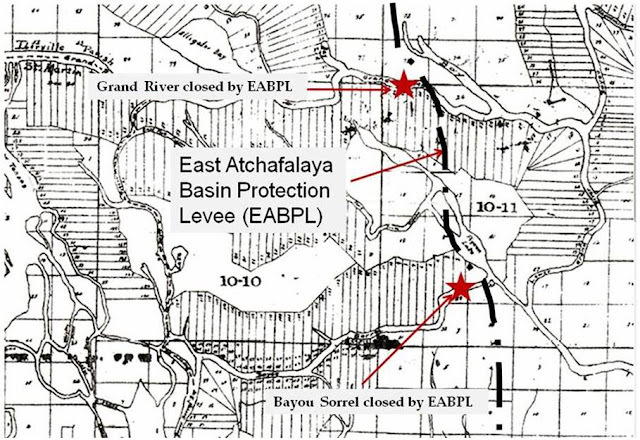 East Atchafalaya Basin Protection Levee (EABPL). This levee begins at the lower end of the levees built along banks of the Atchafalaya River (see the figure below) In the 1950’s the Corps tied the levees of the new Morganza Floodway, into the EABPL. From there it extends southward to and through Morgan City to the Avoca Island Cutoff, and includes the Bayou Boeuf and Bayou Sorrel locks. The length of this system is 106.7 miles, including 1.3 miles of floodwall along the Morgan City front and about 0.4 mile of floodwall below Morgan City. The Atchafalaya Basin Levee District and the city of Morgan City are responsible for operation and maintenance of this feature. 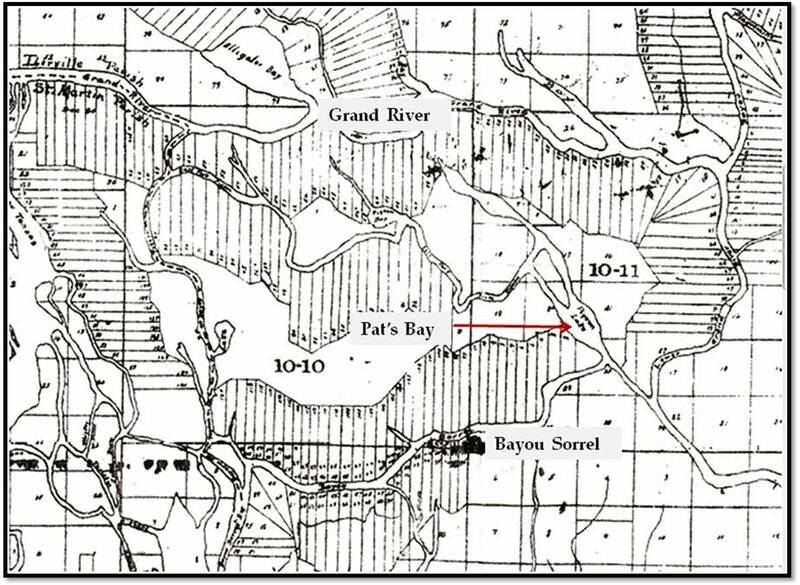 Levee construction in the Upper Grand River area and Bayou Sorrel area had the affect of isolating the Pat’s Bay area, Bayou Choctaw, and Lake Natchez water sheds from the annual spring flood pulse. Essentially freezing that landscape / waterscape as it existed at that time. Stream closures at Upper Grand River and Bayou Sorrel, forced the flood pulse down the new Borrow Canal Channel. 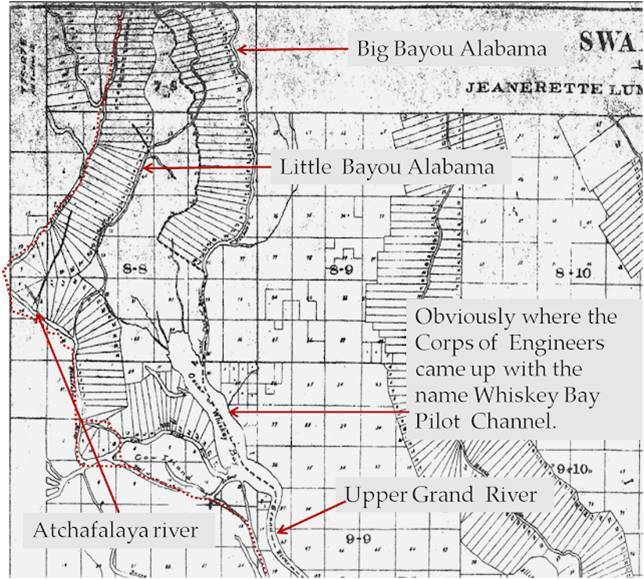 Prior to the Floodway, water flowed down Grand River not only into Little Bayou Pigeon, but through Bayou Choctaw, through Lake Natchez to the Lake Verrett water shed…eliminating critical abundant fresh water flow and nutrients for fisheries. Think about it, Closures at Bayou Pigeon, Bayou Postillion and Bayou Fourche forced the annual flood pulse down the new borrow canal channel. The area to absorb and spread out the annual Flood Pulse was significantly reduced. Construction of the levee cut through cultural features of the Basin. Priceless remnants of the Palfrey Sugar Plantation Sugar Mill were left on the west edge of the borrow canal near Bayou Postillion, the brick floor of the sugar kettles was visible until the 1940’s. Whereas, today they are covered with up to 12 ft of sedimentation. Interesting side note, that 1935 USGS maps show the new levee completed on both sides of Little Bayou Pigeon, but the bayou intact. Obviously, this means closing the gap and actual cutting Little Bayou Pigeon off from the floodway was done sometime in 1936 and after the levees were completed on both sides to that point. The author could find no explanation for this sequencing. Interviews with Mr. Edmond Berthelot and Mr. Felix Berthelot two lifelong residents of Bayou Pigeon, revealed the borrow canal for levees from Bayou Sorrel to Bayou Pigeon was dug wet. While the borrow canal from Old River to Bayou Pigeon was dug dry. Mr. Edmond clearly remembered that cattle would wander off the edges of the dry borrow canal and to had be removed with ropes and much difficulty because the banks were too steep. Both men recalled that closing the bayou was more difficult than the Corps of Engineers planned. At first, a suction dredge was brought in; the dredge was not able to close the opening. A dipper dredge and barge was brought in. The barge was sunk across the gap and spoil was placed behind the barge to keep the spoil from washing out until closure was stable enough and then was removed. Since I could find no photographs of the damming of Little Bayou Pigeon, Mr. Stan Routh and I corroborated on producing a sketch of how it was done. This sketch was based on interviews I had done with Mr. Edmund Berthelot (Ed-Maw), Mr. Felician (Felix) Berthelot. Also Mr. Ray Gilchrist, unpublished book, Stories of a Bayou Man. 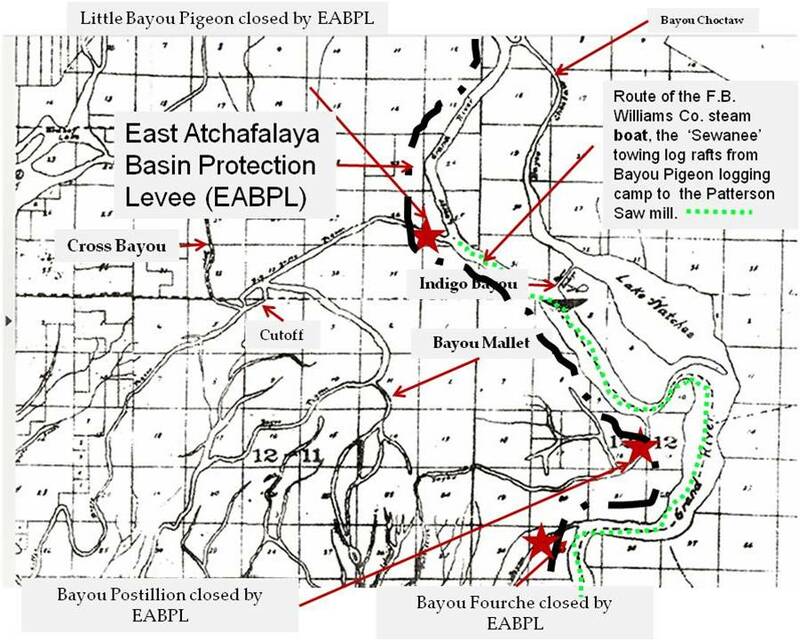 I also used pictures of the closing of a cut left open in the new levee one mile south of Little Bayou Pigeon (see pages 250 - 254 of the Bayou Pigeon Book), The logic and reason leaving that cut open and closing Little Bayou pigeon is unknown. That cut was finally filled in 1945. I view the damning of Little Bayou Pigeon as the single most important event to shape the destiny of Bayou Pigeon, physically and culturally. Sort of Like the battle of Gettysburg of the Civil War and destiny of the USA. Priceless information / heritage that would have lost without their interview. Blocking Old River was a game changer, both naturally and culturally for the Lake Verrett water shed, good and bad, depending how you want to look at it. Why is that? 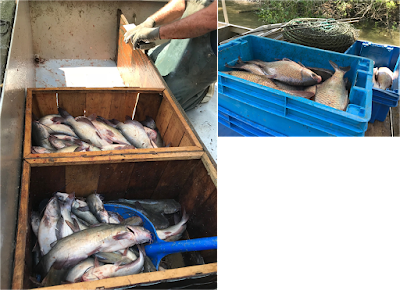 Lack of water flow from annual flood pulse through Old River protected the surrounding swamp from sedimentation and at same time reduced the nutrients for the fisheries in that area. On the positive side, we have a living snap shot of what the Atchafalaya Basin looked liked before the Floodway, when the hydrology and sedimentation patterns were changed by man. This guide levee begins near the town of Hamburg, where it joins the Bayou des Glaises fuse-plug levee, a levee designed to fail in extreme floods. It extends in a south and south-easterly direction to the Wax Lake Outlet at the latitude of the East and West Calumet Floodgates and thence eastward through Berwick to the Gulf Intracoastal Waterway. This levee extends 128.7 miles and connects with 3 miles of floodwall along the front of the town of Berwick. Structures along the levee include Bayou Darbonne and Courtableau drainage structures, the Charenton Floodgate, and the Berwick Lock. The Red River, Atchafalaya, and Bayou Boeuf Levee District, the Atchafalaya Basin Levee District, the town of Berwick, and the St. Mary Parish police jury manage the WAPBL levee. 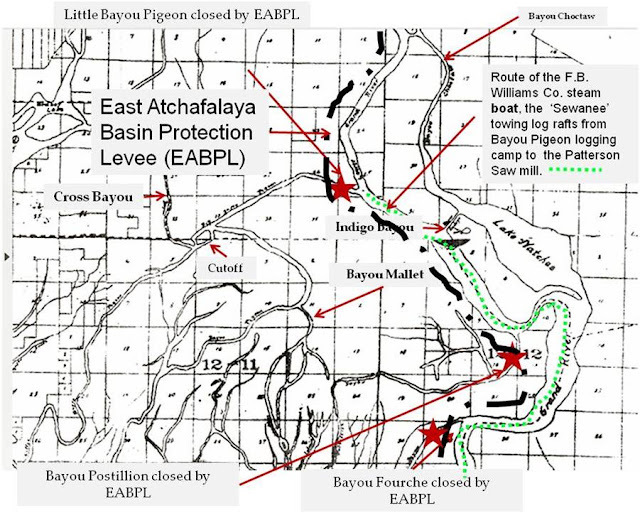 Bayou Grand Gueule, Bayou Benoit, Bayou Grand, Bayou De plomb, Little Gonsoulin Bayou, Bayou Eugene, Bayou Gravenburg, all closed by west Atchafalaya Basin Protection Levee (WABPL). Thus, we have another archaeological relic, Lake Fausse Point and surrounding swamp. When the WABPL levee cut the distributary flow of the bayous flowing into it, without the flow of water and sedimentation it was basically frozen in time. It looks now pretty much like it looked did in the 1930s. The landmass there is virtually unchanged, except now it has a lot of trees that grew over time. Before the floodway levees could be finished, the Army engineers were concerned floodway guide levees would not be enough to handle a 1000 year flood. The Corp quickly added to the floodway plan Atchafalaya River Main Channel Improvement Dredging. 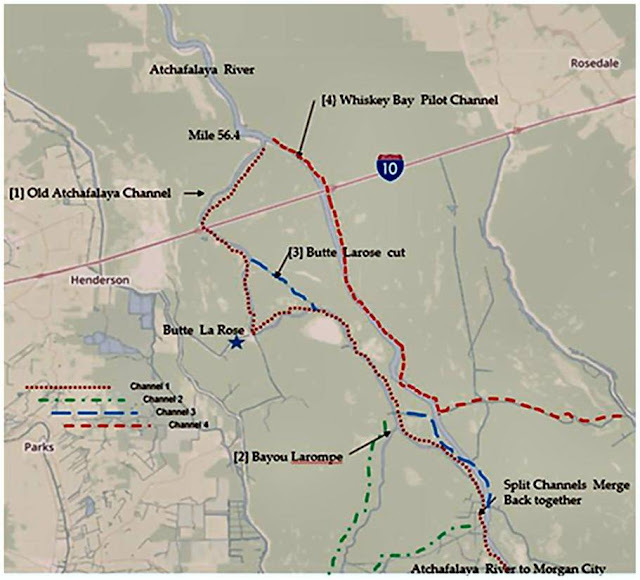 The straightening, widening and channelization of the Atchafalaya River main channel to increase flow capacity and speed the flow through the basin. 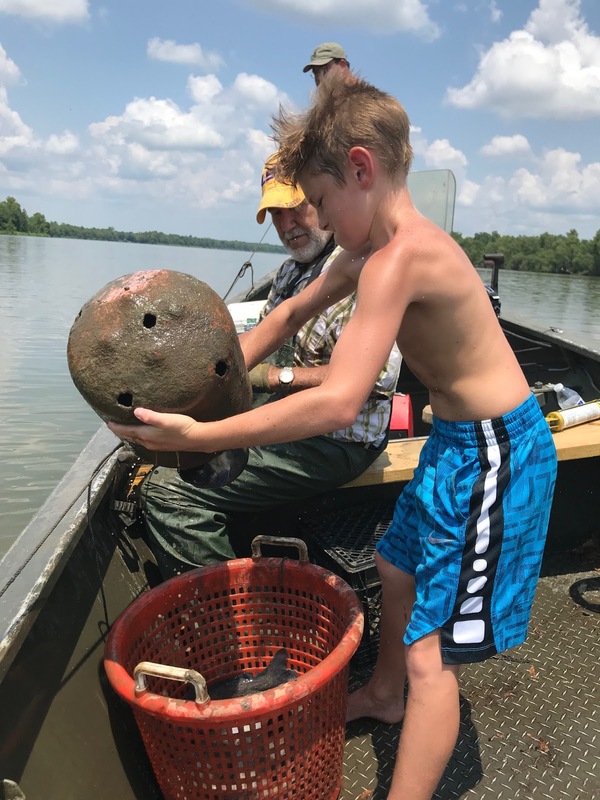 The dredging was to extend from the Atchafalaya River at Alabama Bayou to the main body of Six Mile Lake on the southern end of Grand Lake system. 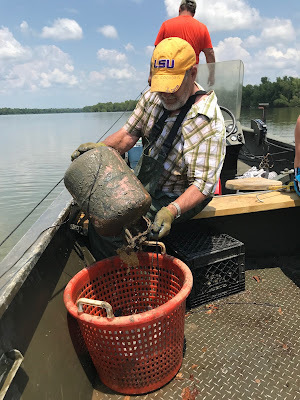 In addition to the Whiskey Bay channelization, other sections of the Atchafalaya River main channel were dredged plus some other distributary streams were dredged. 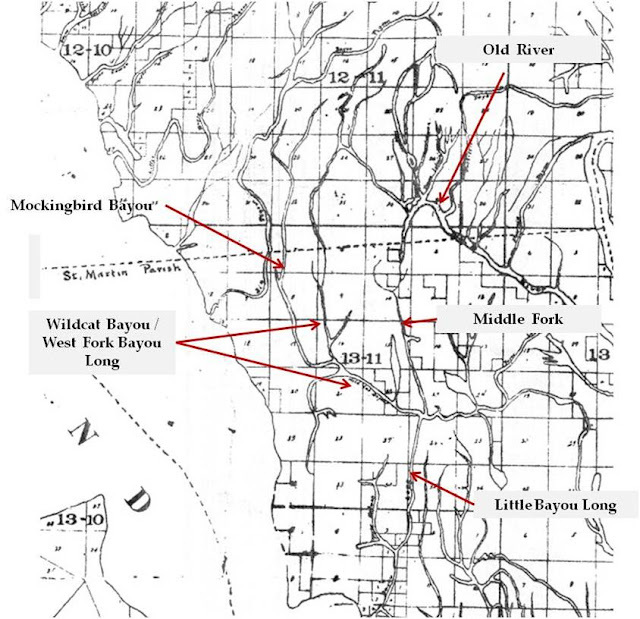 Still other historic distributary streams were intentionally closed where they left the river to force the bulk of the flood pulse to stay in the main river channel and hence, to scour the channel wider and deeper naturally. 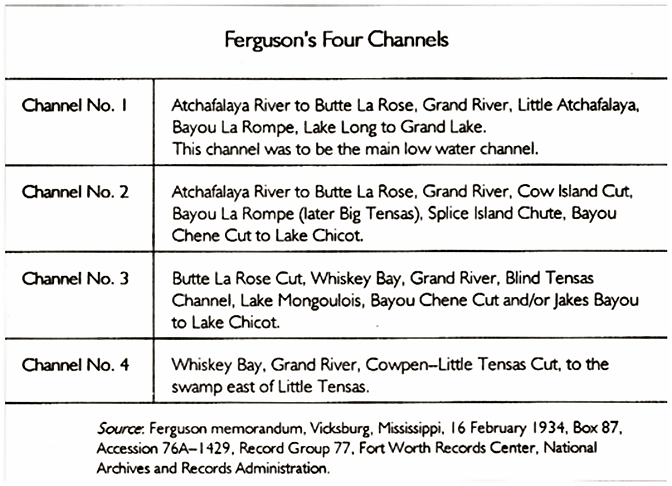 Dr Martin Reuss, Corp of Engineers historian cautioned me that Ferguson's Four channels may not have been completed as drawn. There is data to suggest that conditions on the ground changed some the dredging plans / operations. Actual Post-1932 Dredging; By Gordon William McCain, University of Arkansas, Fayetteville, Masters Thesis. 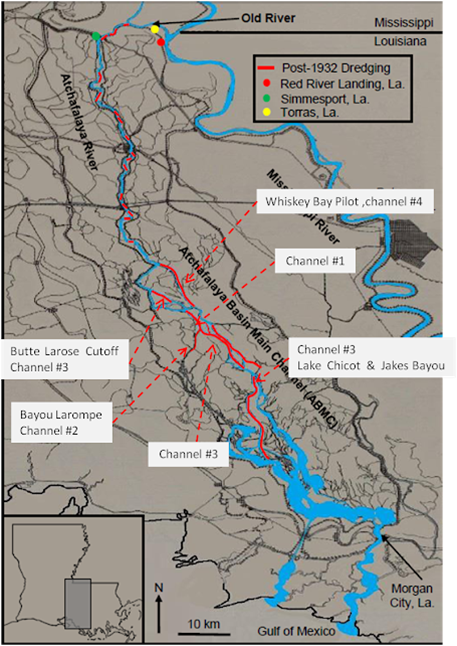 The solid red lines indicate dredging locations from 1932-1948 along the Atchafalaya River and other distributary channels . No work has been performed on channel dredging since December 1968. 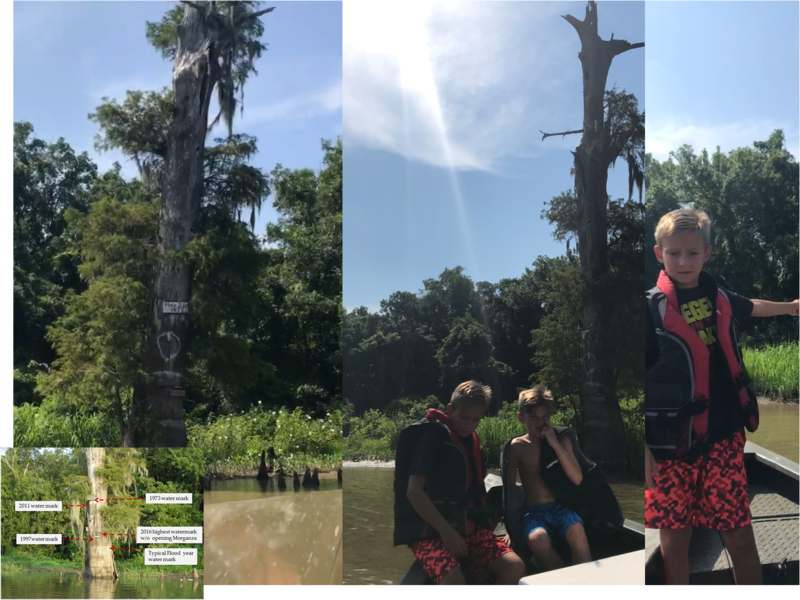 Alabama Bayou, (sometimes referred to Big Alabama Bayou) and Little Alabama Bayou were off chutes of the Atchafalaya River, below Krotz Springs, LA. around river mile 45. They flowed south parallel to the Atchafalaya River’s main channel. In 1935 the Corps of Engineers closed the lower end of Alabama Bayou where it re-entered the Atchafalaya River and a number of other distributary bayous, (Bayou Courtableau, Indian Bayou) to increase the flow of water in the main channels. 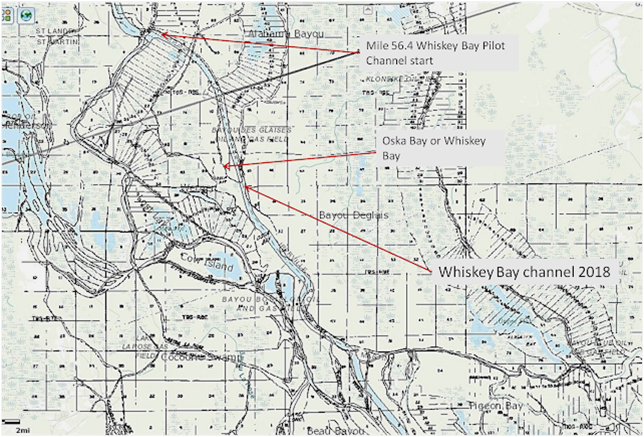 Between 1934 to 1937 the Corps created the Whiskey Bay Pilot Channel, a 40 ft deep and much wider channel not only to speed water flow for flood control but to improve commerce and marine traffic. The man-made Whiskey Bay Pilot Channel was dredged in the old bed of Big Alabama Bayou through Oska / Whiskey Bay Chute. The wider and deeper Whiskey Bay Channel had the almost immediate unintended effect of reducing the flow of the historic Atchafalaya River channel through Butte La Rose and sending 75% of the annual flood pulse each spring, straight down Little Tensas Bayou straight down through Lake Mongolois, Lake Chicot to Grand Lake. 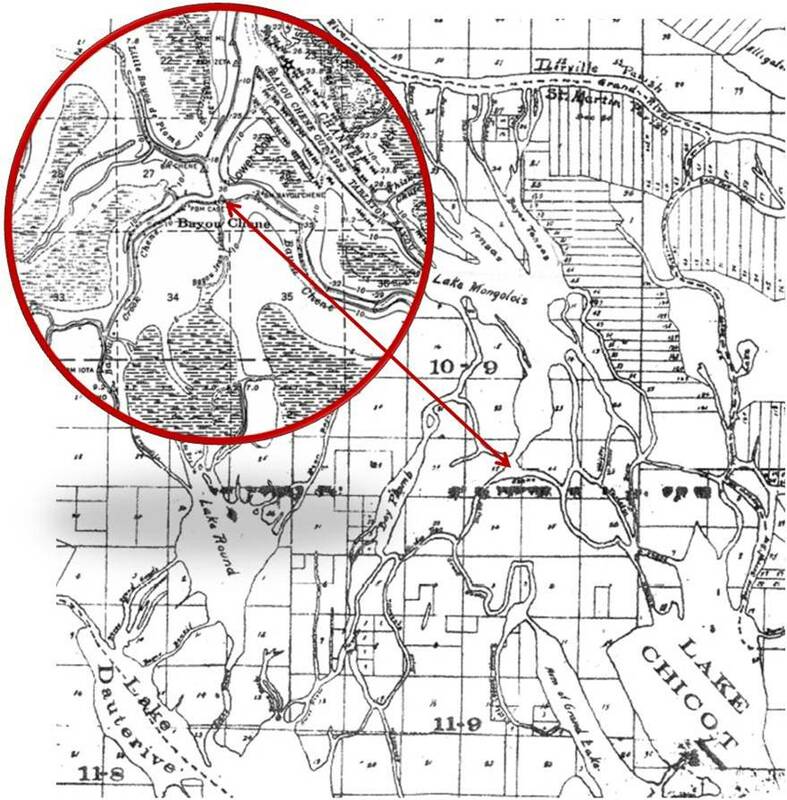 From that point, you could say, the fate of Grand Lakes was sealed, increased sedimentation filled in Grand Lake. 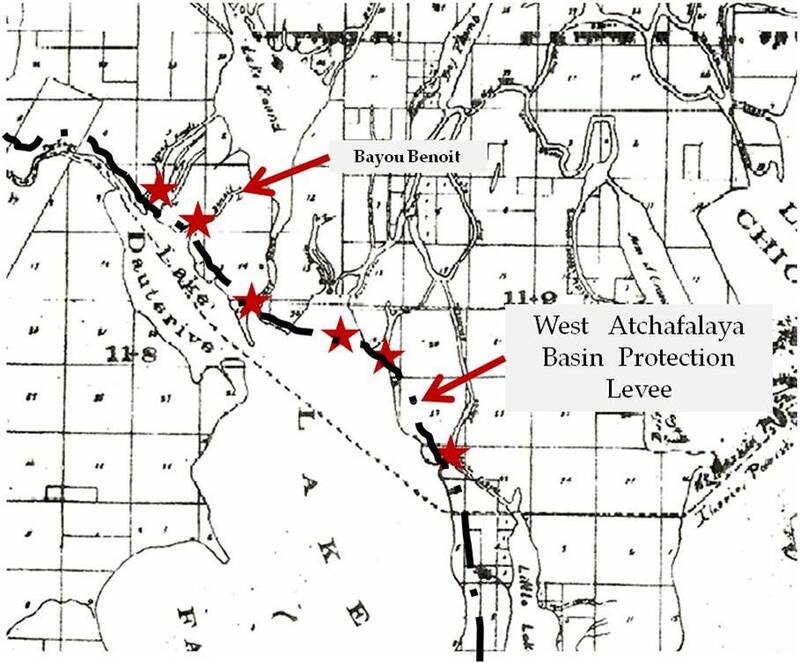 The Atchafalaya Floodway project has produced many undesirable results for the Natural and Cultural Heritage of the Natural Atchafalaya Basin. Intuitively obvious was the levees increased the height of flooding inside the Basin; areas that only flooded in extreme condition were now inundated every season. Removal /blockage of drainage paths from the upper reaches of the Grand River watershed into the basin increased flooding in low areas outside the Basin levees as rainwater in the upper reaches moved through a restricted path on its way to the Gulf of Mexico. The result, heretofore unseen backwater flooding. Higher flood levels inside the levees forced eventual permanent migration of residents from small communities like Bayou Chene, Atchafalaya Town and countless isolated shanties’ built on the natural alluvial ridges of bayous and streams throughout the basin. Even houseboat communities were not spared; you could not have a small garden or raise chickens. The closing of streams at the levees and the main channel also reduced the amount of water flowing through the cypress-tupelo swamps and, in many cases, forced water to flow back into areas from the south instead of entering from the north, as it had before the closures. The back-flow filling of swamps and lakes aggravated sedimentation and removed the natural flow of water through those areas. The flow that had washed silt and decayed plant matter from the swamps in high water times, tended to flow into an area, slow down and sit until the water level dropped significantly, often draining only once in a flood cycle instead of continually as it had in the past. The result of the new patterns caused by the levees and stream closures has been the loss of the open and deep water areas inside the Atchafalaya Basin Floodway System (ABFS). Thousands of acres of open water in the chain of Lakes, i.e. Lake Chicot, Flat Lake, Grand Lake, Duck Lake and Six Mile Lake are now willow flats and stands of cottonwood trees. A new inland delta formation was created, caused by the increased silt carried by the deep, straight channel being dropped in the wide, slower-moving lake. While the new land might be good habitat for some wildlife, the lack of deep water makes it harder for fish to flourish during low water and high temperature periods. On the other hand, in the 2011 flood the Atchafalaya Floodway help / played a major role in protecting 4.1 million people, kept 10 million acres from flooding,and prevented 108 billion dollars in damage. Keep in mind the cost benefit ratio over time. The levees end flood plain becomes almost 20 miles wide. 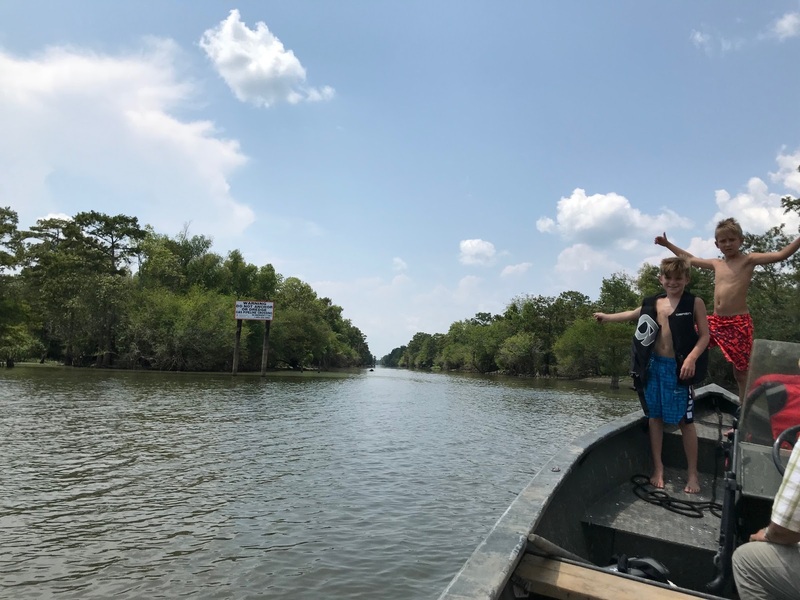 The Atchafalaya River divides into smaller channels flowing through extensive forests, swamps of the Atchafalaya Basin, and some of its small communities. Below Upper Grand River bottomland hardwood forests fall away with the high ground and or replaced by the largest contiguous stand of cypress-tupelo gum forests in North America. From Upper Grand River to Flat Lake in the East Basin, and from Butte La Rose to Bayou Teche in the West Basin the cypress-tupelo gum swamps line most of the bayous, lakes and canals that parallel the main channel. Below Morgan City high ground falls away completely and are replaced by endless grass and cane marshes with some willows and other scrubby undergrowth. The Atchafalaya Basin is still great and a National treasure. By U.S. law the Corps of Engineers is mandated to provide a multipurpose comprehensive plan for the Atchafalaya floodway. One that provides flood protection to south-central Louisiana and at the same time preserves the natural ecosystem of the Atchafalaya Basin within constraints of budget and logic and reason. 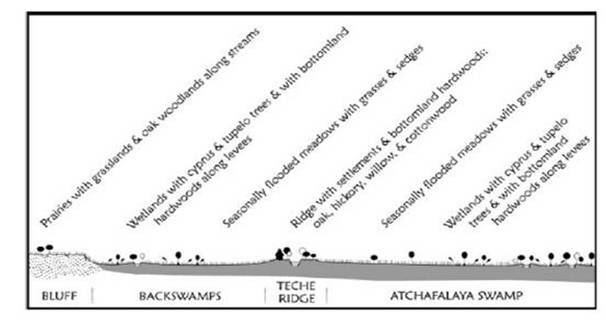 The strategy of the current Multiagencies Atchafalaya Basin Management Program is to restore historical overflow patterns to the extent practicable, encourage free flow nutrient providing water over bank movement through defined management units, and reduce sediment deposition within the ABFS with the ultimate goal of restoring and enhancing the aquatic environment. The effect of today’s depth and duration of flooding crosses multiple scientific disciplines, e.g. Forestry, Fisheries, Wildlife, Hydrology, Civil Engineering, etc. It affects our forests. It affects our fisheries. 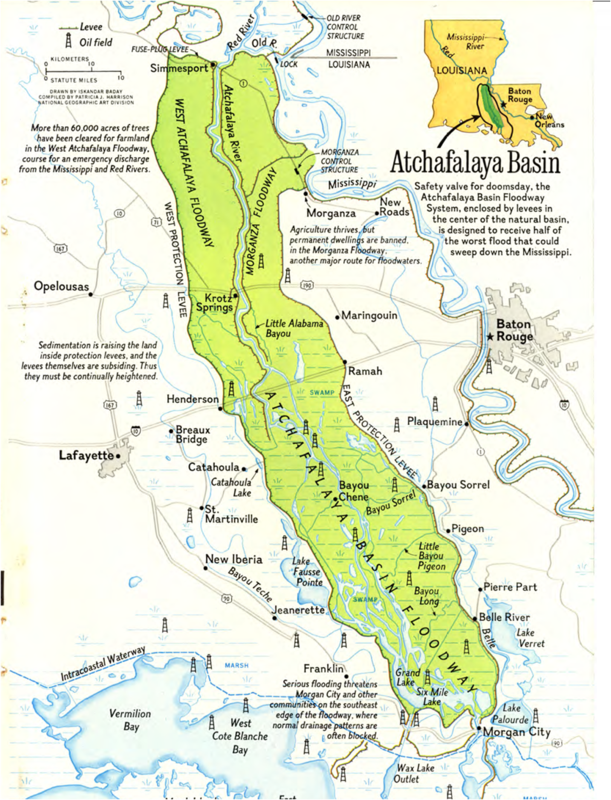 The Atchafalaya Basin was a free flowing River Basin System until the 1930’s. To restore its historical overflow patterns is not practical, we cannot turn back time, but we can start looking at ways to slow this artificial acceleration. 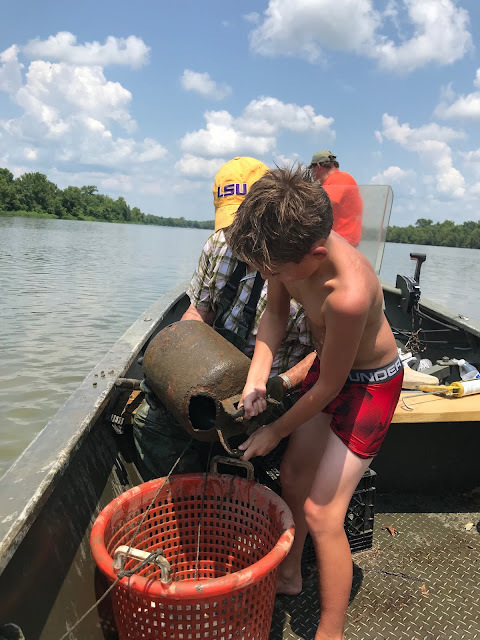 If we are going to work on restoring the ecosystem of the Atchafalaya Basin as much as practical, first, you must know what you are restoring it to. Which begs the question, what is the baseline? 1. The current Atchafalaya Basin is still great, still a national treasure, but it is not the free flowing river system it once was. 2. The ecosystem / folklife ways have changed but they are still similar / recognizable to what it was in 1932. 2. We are not alone. The Yellowstone River in Montana is the only major free flowing river in the contiguous 48 states that has not been severely altered for flood control, navigation or hydro-power. 3. Building the Atchafalaya Floodway was done for the benefit of the entire United States of America. Channelization of the streams of the Atchafalaya Basin, widening and deepening the main river channels, kept the physical size of the floodway to a minimum. To the U.S. Government flood control, saving lives and property is paramount, everything else is secondary. Trade offs were and are still are required of everyone. However, that does not mean local government / agencies have no input to planning, strategic and tactical. 4. 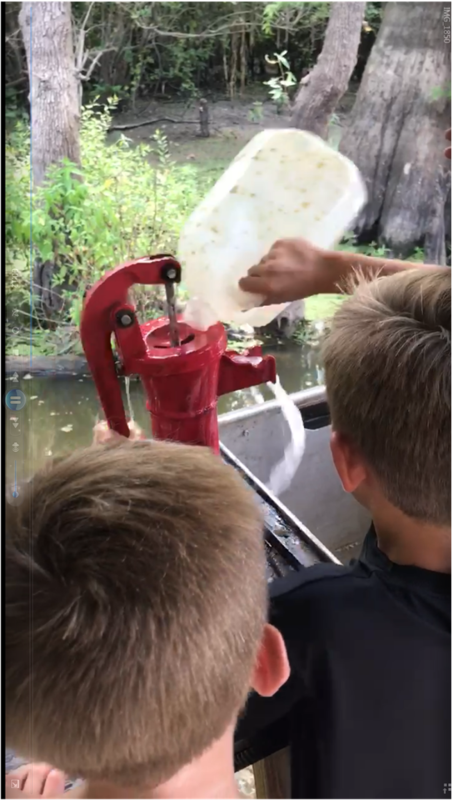 Over the years we have over manipulated / over managed the Atchafalaya Basin, for just about everything, from industrial logging, flood control, marine transportation / logistics, discovery and production of fossil fuels, dumping grounds for hazard wastes, recreation and so on. That does not preclude the future need for some of those activities. It means that prudent management is required. 5. The Atchafalaya Basin cannot be fully restored to a free-flowing river basin system. The best we can do is to protect, preserve and work to restore much as practical. 6. Murphy's Laws... Everything will eventually happen given infinite time. 7. 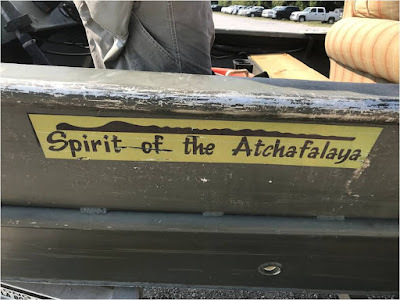 The Atchafalaya says...Let My waters flow! Joann Mossaa, Department of Geography, University of Florida, Gainesville, FL, 32611, USA, 31 Oct 2013. The Control of Nature: Atchafalaya, McPhee, J. 1987. Hall, John Whitling, "Louisiana Survey Systems: Their Antecedents, Distribution, and Characteristics." (1970). LSU Historical, Dissertations and Theses. 1724. Taylor, James William, "The Agricultural Settlement Succession in the Prairies of Southwest Louisiana." (1956). LSU HistoricalDissertations and Theses. 157. 'The Way Things Were by a Bayou Man, Mr. Ray Gilchrist, unpublished. 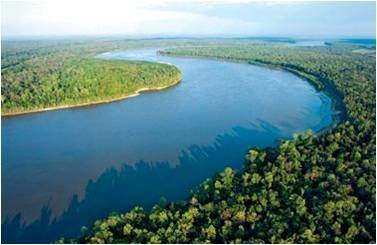 Controlling The River: Maintaining The Mississippi River For National Commerce. From the records of Mr. Claiborne Landry who had the right of way clearing contract for the section, Bayou Sorrel to Bayou Pigeon, and 'The Way Things Were by a Bayou Man, Mr. Ray Gilchrist, unpublished.